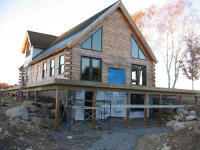 Click here to continue with the logs from October 17 to October 31. After three days away from the jobsite, I was anxious to get back to work. I began bright and early with my habitual pre-dawn journey to Lowe's to pick up a wide variety of items, from a toilet to outlet face plates, from drywall mud to finish nails, and from tape measures to shower drain fitting. I arrived back home before 8, and unloaded my haul. It was at about this point that I noticed that my toilet box read "round front"...uh-oh. From the display at the store, it seemed like the Kohler Wellington--a unit we had used previously with good success--came only with the elongated bowl, which I wanted. I opened the box and confirmed by fears: this was the wrong thing. Grr. I was not pleased with this development. Will I ever learn to double check the things I pick up? And why wasn't it more clear that there was a choice, and that the stack from which I took my unit was round and not elongated in the first place, Mr. Lowe? I managed to get past this annoyance, and since I wasn't sure if Bob would want or need my help today, I sort of dubbed around on some smaller things while I waited for him to arrive. I thought I'd install the outlet face plates in the kitchen, to cover the outlets I installed a while back. I opened the first one and installed it, and noticed immediately that the color didn't match. 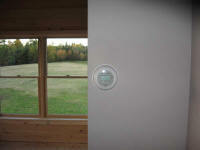 I had installed tan outlets, and had picked up tan faceplates. What gives? It turns out I had actually (and without knowing so) installed almond outlets, while my faceplates were ivory. Come on, will you? They're both nearly the same color, but just incrementally different enough to be blatantly noticeable if compared directly. I thought there were three choices: white, tan, and brown. But almond and ivory? Isn't this placing too fine a point on an el-cheapo receptacle? It never crossed my mind to consider that there might be a different tan. I was extremely annoyed at this, which, on top of the toilet debacle, more or less negated my entire trip of the morning. I almost headed right back immediately, but logic prevailed and instead I made plans to return tomorrow morning--aggravating, but better to just go and get the exchanges done. 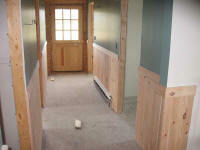 Besides, I had been looking forward to an operating bathroom in the house, and didn't want to delay much longer. When Bob arrived, we eventually decided that he could do most of the work alone, and that I would work inside as necessary, though of course I'd be available at any time to help out as needed outside. So I got to work on the mud in the upstairs, and applied a third coat to the upper part of the bathroom, and a second coat to the remaining areas of the closet with the new bucket that I had picked up. 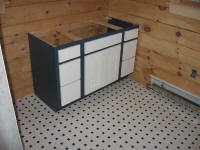 Next, I installed the vanity cabinet in the downstairs bathroom. This went smoothly, and I didn't even need to shim it for level. I did shim behind the solid pine back supports since I had to hold the cabinet slightly away from the wall to clear the electrical wiring running to the outlet box above the cabinet. 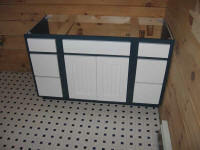 For this cabinet, we chose a maple frame painted Jamestown blue, with white maple drawer fronts and doors with a Shaker bead. The drawer fronts ended up a bit more blank than I had expected, but since we had yet to choose our hardware it seemed that some good hardware could liven things up. Otherwise, I liked the cabinet. 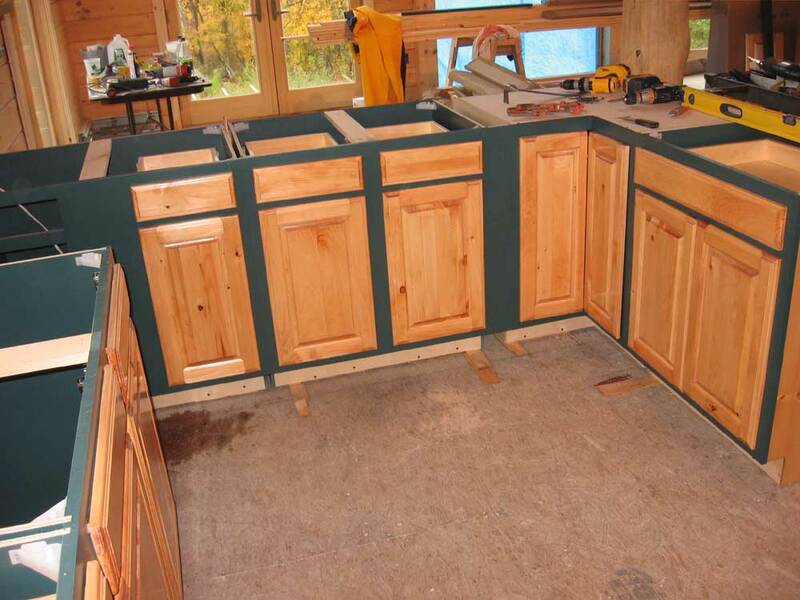 Later (soon), I'll build and install a standard Formica countertop. 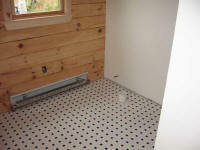 I installed a drain fitting in the downstairs shower pan in preparation for the final connection in the basement. I bedded the fitting in lots of plumber's putty and tightened the nut from the basement beneath. I also installed the closet flange in the floor. With a large quantity of wood flooring due here tomorrow afternoon, I decided to move the pile of blank trim stock and my pre-milled stack from the horses in the living room down to the basement for now. Once I cleaned up that pile, I brought up several pieces of baseboard trim, which incorporates a beveled top edge, and sanded them all before applying two coats of polyurethane during the afternoon. 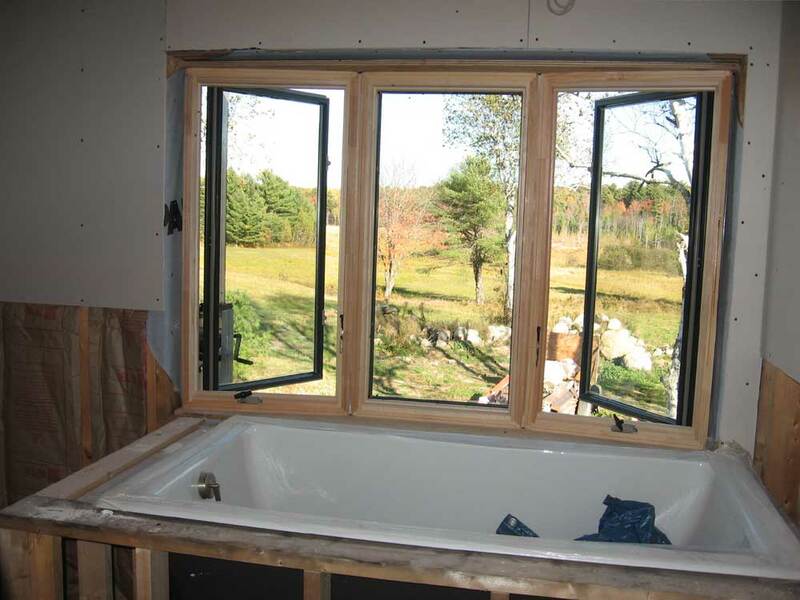 I also poly'd the two window frames in the downstairs bath. I'm going to try and poly a few windows every day or two to break up the process, but to also get it done in plenty of time to move in, and before finished floors go down. I finished up the day by installing 5 or 6 of the cheap porcelain light fixtures in the basement. I had installed 11 boxes some weeks ago, along with the wiring, and now I began to wire these up so that I'd have light in the basement; I figured my cutting station would probably move down here sooner than later, once the finish floor was installed upstairs. I hated installing these cheap fixtures. I just don't understand why the manufacturer couldn't leave more room around the screws for the wires; things were extremely tight, particularly for the 12 ga. wire I was using. Would it have killed them to leave 1/4" clearance around the screw, rather than to have it nearly butted directly against the molded contours of the back side of the fixture? Who designs these things? While I worked inside, Bob worked on the deck framing, picking up where we left off last Wednesday. New material had been delivered Friday, sometime after we left for the weekend, and he finished installing the joists, cut the ends to length, and installed the double box frame. I helped hold some of the larger pieces of the box frame, but that was about it. 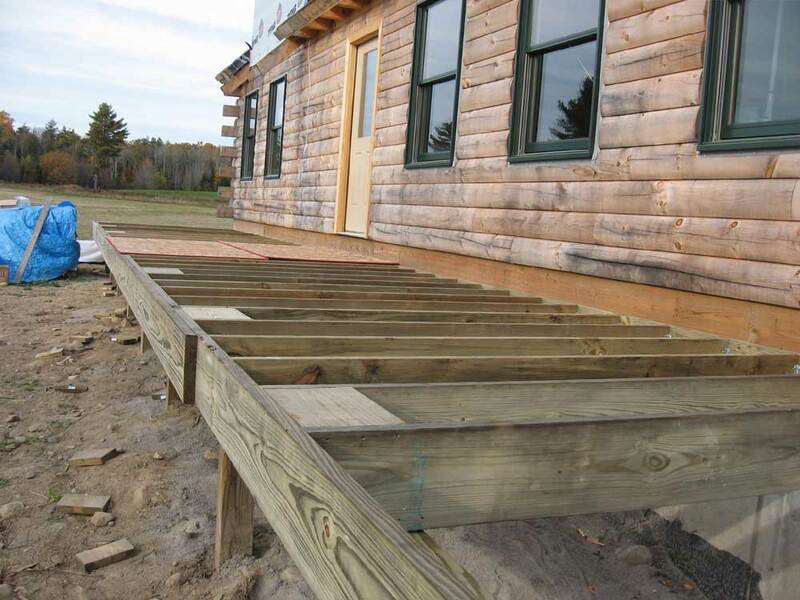 He also installed some blocking in the area where the front porch met the large deck off the south end, where we planned to miter cut the deck boards. 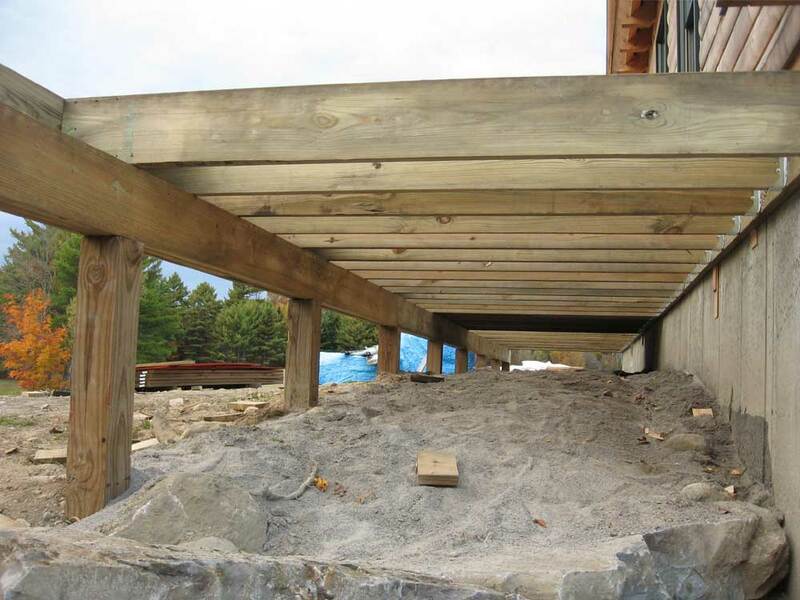 Because of a slight error in planning, he also had to install blocking at the end part of the deck so that the deck boards--which change direction at the front corner--would have the proper 16" on-center support; the joists were running the wrong direction in this area. The end result looked so neat and orderly it reminded me of cubby holes, or some such. 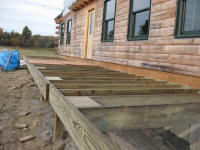 That will be a very sturdy part of the deck! We had heavy rain and very strong winds overnight, which kept me awake for a time. When I arrived at the house this morning and climbed the basement stairs, imagine my surprise to see a large puddle of water in the hallway at the top of the stairs! It took me a few seconds to trace its source all the way back to the exterior log wall in the pantry. Now it became more clear: with the strong southeast winds overnight, which would have beat the rain directly into this facade of the house, the rain had made its way under the first course of logs, since I had yet to install the log siding skirt beneath the logs that would seal off this area. We rarely get such strong winds from this direction. 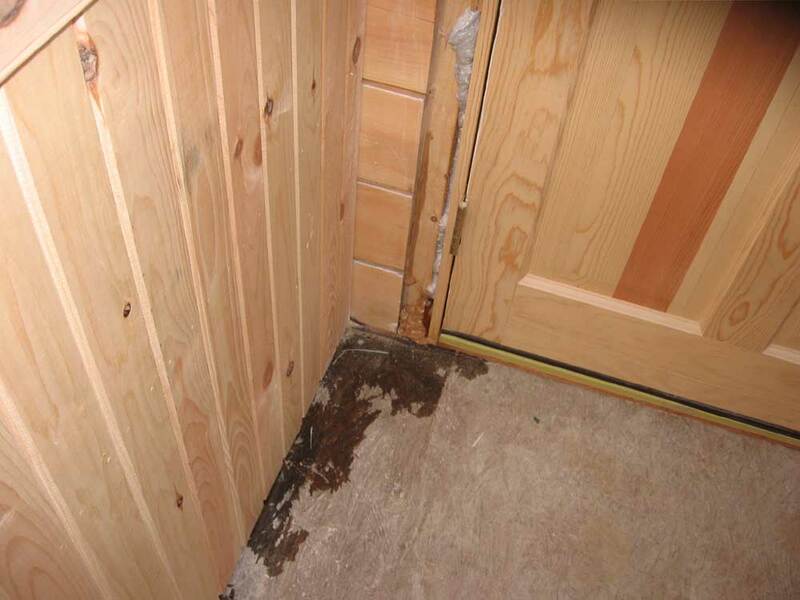 I located a few other leaks here and there, mostly around windows and doors, probably since I had done no exterior work on the windows and doors, and they still required caulking, rubberized flashing, and trim. Small leaks were no surprise here. 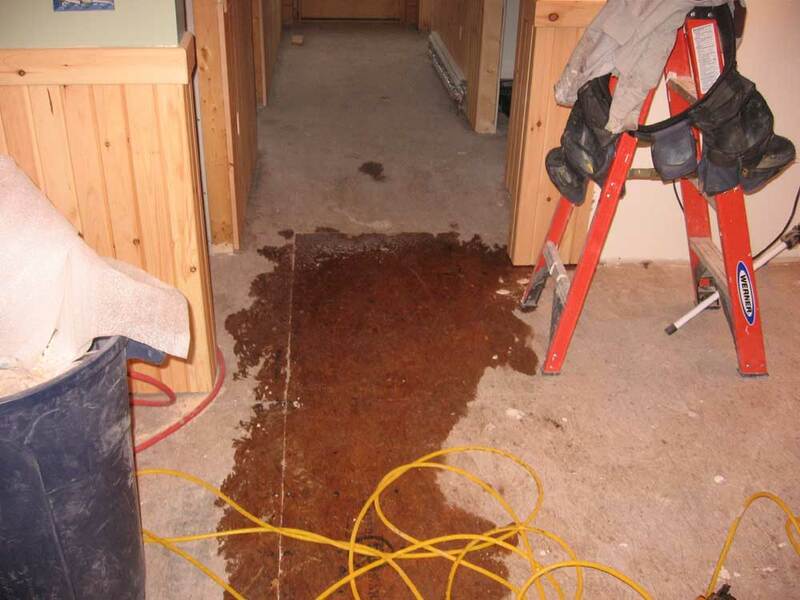 The tarp covering the fireplace opening was still in place, but water had driven beneath it--no surprise at all here. I guess I should be glad the tarp survived the night. Anyway, no harm was done, but I resolved to take care of these exterior projects as soon as I reasonably could. I got right to work on the kitchen cabinets where I left off yesterday. 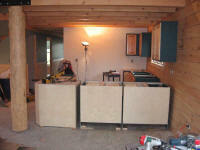 With no walls to secure these too, I needed to install blocking on the floor, into which I could screw the cabinets. I traced around the inside of the cabinet base, which I could reach from the back, and then removed the cabinet to install the 2x4 blocks. I just shot these into the floor with my nail gun. I replaced the first cabinet and spent some more time leveling and positioning it. This was made challenging by the fact that the floor began to drop off significantly between the sink base and this peninsula cabinet, and they were not directly connected thanks to the gap in between for the eventual dishwasher. I had to raise the cabinet nearly 1/4" with shims, but after some fussing I got it level in all directions, and with the other cabinets. The proper positioning was very important, of course, since not only did the peninsula have to align and level properly with the other cabinets, but the first cabinet would also be the benchmark for the remaining peninsula. Once I had it right, I screwed it to the blocking through the toekick and the cabinet side. I continued with the other cabinets in the peninsula, though these went more quickly since I had the accurate first cabinet to use as a reference. When I reached the corner cabinet at the outer edge, where the peninsula makes a 90° turn, I discovered a problem, though: the cabinets were 3" short of my layout. I checked for any spacers or fillers that should be in there; none were noted. I double checked the physical measurement, but was still 3" short. This wasn't necessarily the end of the world, but I wanted all the counterpace I could, and besides: the extra 3" made the cabinets relate better to the nearby log post. I decided to measure each cabinet box to ensure that I wasn't sent the wrong thing. I immediately discovered that the blind end cabinet, the first one in the line, was 36" long, where it was designated as a 39". There were my missing three inches. 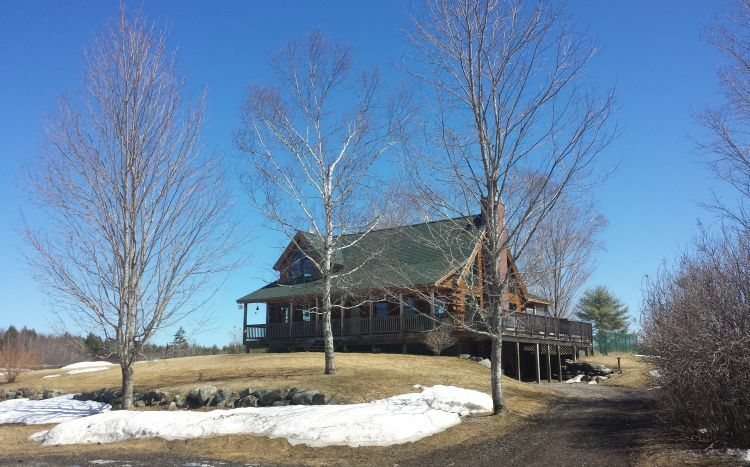 I called Wendy, the kitchen designer at Moose Creek, and related the problem to her. I already had my fix, though: I planned to install a 3" spacer, of which I had three, between the outside corner cabinet and the next one in. Easy enough, and not particularly noticeable. Another option might have been to pull the first cabinet 3" further from the wall; it was already pulled 3" away from the wall to better allow the door and drawer to operate in the corner, but the middle stile was wide enough to allow more. This would have meant undoing all the work so far, moving the blocking, etc...which wasn't going to happen. The only problem was that by using one of these spacers, I'd end up short later on, when I needed one on one side of the range hood. But I had no need for this right at the moment, and figured I could easily get a replacement. This was my suggestion to Wendy, along with double-checking to ensure that I got the right or wrong cabinet, and was appropriately charged. Later, I heard back, and she told me that the cabinet company said the 39" blind corner cabinet is supposed to be 36". Huh? Come on, now. All cabinets are designated by an alphanumeric code that usually includes letters as shorthand for the cabinet type (i.e. 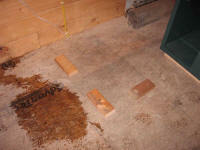 W for wall, SB for sink base), followed by a number that indicates the cabinet length. This is standard in the industry, and all other cabinets ordered from this company were so designated--and accurately so. The cabinet in question was called a "BC39L", for "blind corner, left side"...and 39" long. It also came in a 42" and 48" version, but not a 36". This was a ridiculous explanation, but whatever. I had already finished the entire installation by the time I heard this, and had implemented my solution. Who can wait around for silliness like this? I installed the spacer, and then the corner cabinet before turning the corner and installing the final base cabinet in the second peninsula. I finished this up at 10:30. I decided against installing the end panel for the refrigerator and the over-fridge cabinet for now, since I wanted to make sure they fit properly against the range. There are no cabinets between the range and fridge, and I didn't want to rely only on measurements--particularly when the fridge was inaccessible in the moving company's storage and I couldn't even get a physical measurement. It'll be easy to do these later, and they won't hold up the countertop process. I was done with the kitchen cabinets before I originally even thought they'd arrive. Pretty good. Now, I wished that I'd had the granite people come earlier instead of way off on next Thursday, but if I'd scheduled them too soon probably something would have gone wrong and I would have had to really push to get done. 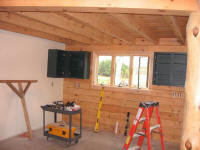 Now, I could relax, knowing that the cabinets were all set, and focus on the myriad other jobs. I love the cabinets. They look great, and seem pretty well made. 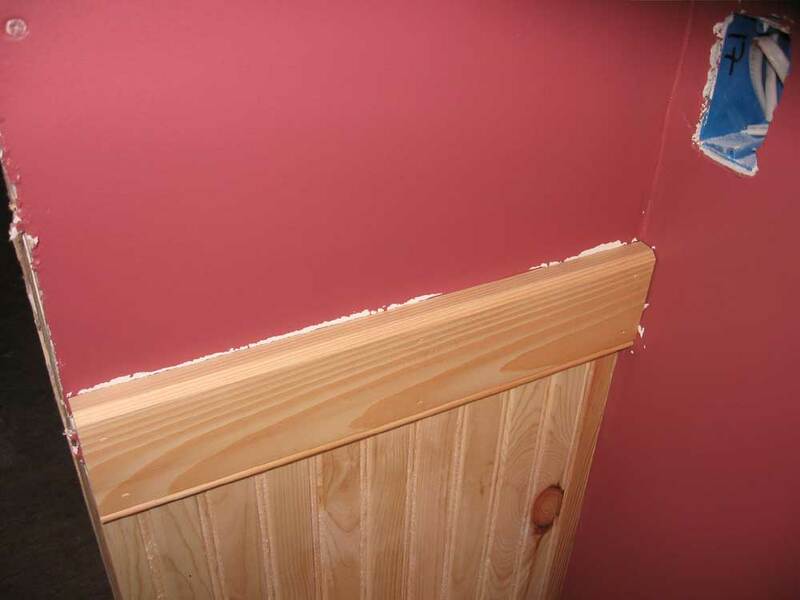 Would you believe I actually had to sign a waiver, at the time of ordering, stating that I understood that they were wood cabinets and that the paint might crack at the joints between the various pieces of the face frame? The thought that someone might not expect this just makes me shake my head. I suggest some nice white Formica cabinets for those people who can't seem to handle the natural characteristics of wood. I wanted to grout the floor in the downstairs bathroom. 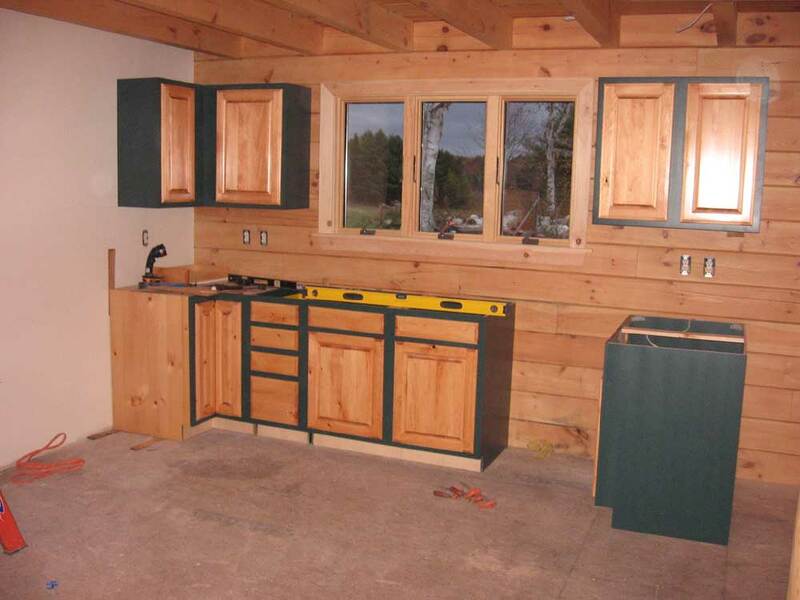 But by the time I cleaned up from the cabinets, hemmed and hawed over the refrigerator panel and cabinet, and so forth, it was getting close enough to lunchtime that I didn't want to mix the grout and start the project just then. Instead, I tackled the remaining Homosote in the loft, and completed this by lunch. This was one of those grit-my-teeth-and-get-it-done tasks...absolutely zero enjoyment and fulfillment. But now it was done. 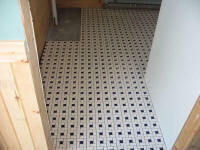 After lunch, I mixed the grout and then grouted the floor. 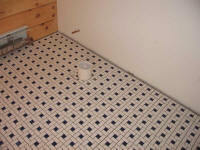 I like grouting: you make a big mess, and then clean it up. 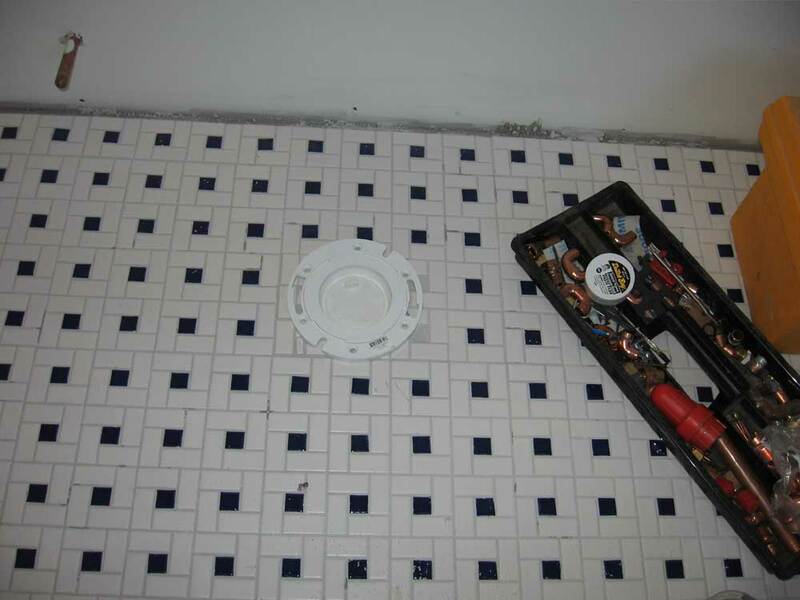 Grouting small joints, like those in this tile, is particularly straightforward, since there's less tendency to remove too much or too little of the grout from the joints. 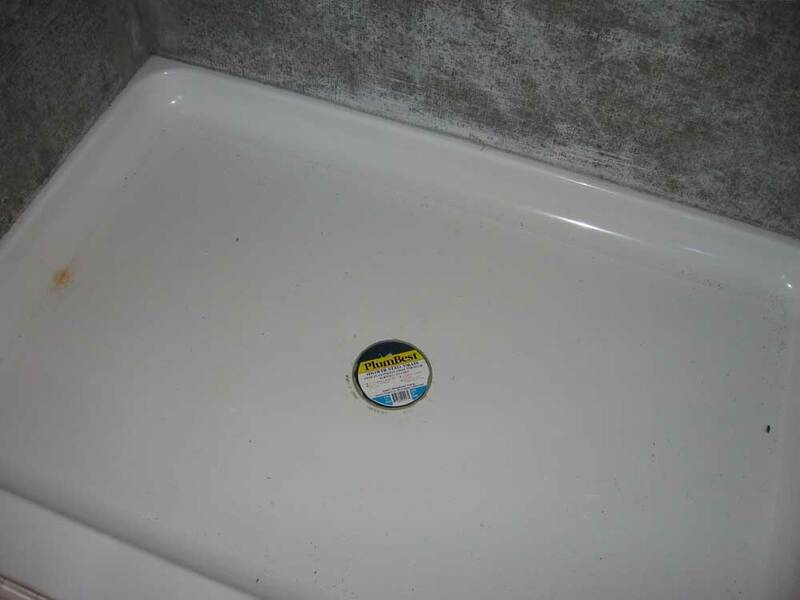 We chose "warm gray" grout. Next, I lugged the remaining cement board (about 11 sheets and some scrap) up to the bedroom upstairs so that I could begin installing it in the upstairs bath. Why is this stuff in 3x5 sheets? I know that weight of the product has to be limited, but still. 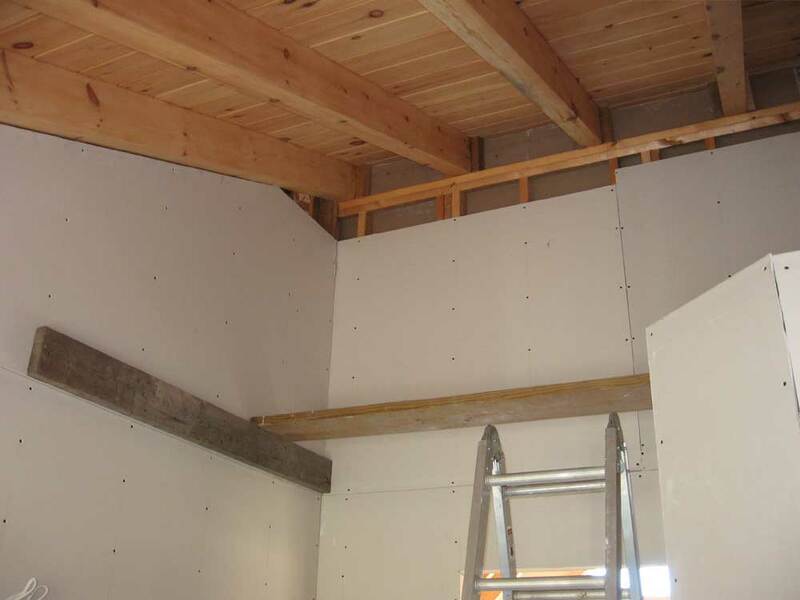 Neither direction is the proper dimension to fit conventional stud spacing, so that means that each sheet must be cut when hanging on a wall. What a ridiculous product. They should be at least something like 3x4, so that it would fit the stud spacing. Things'll be different when I'm in charge, let me tell you. 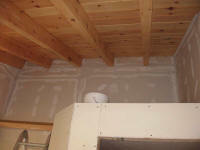 I got some of the cement board on the floor and then started on one of the walls. 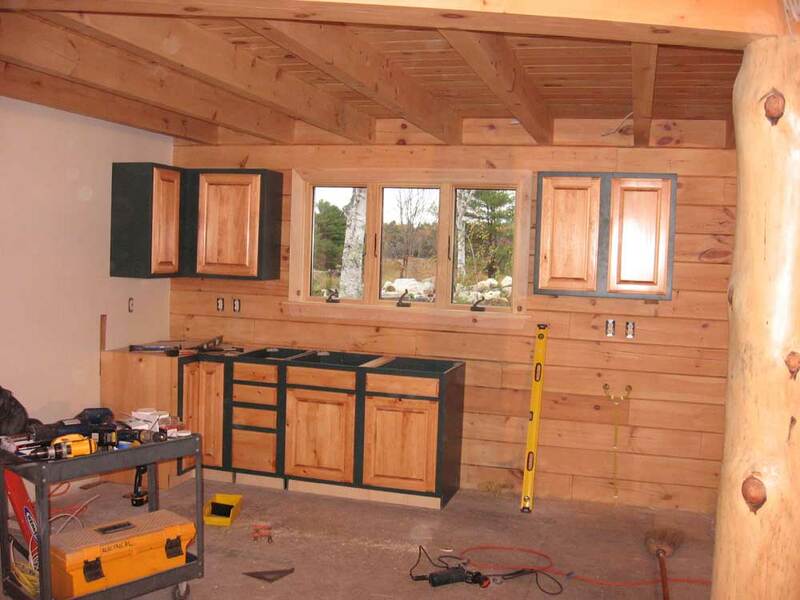 I want to at least get enough done in the very near future so that I can consider installing the vanity cabinets, so that they're out of the way. 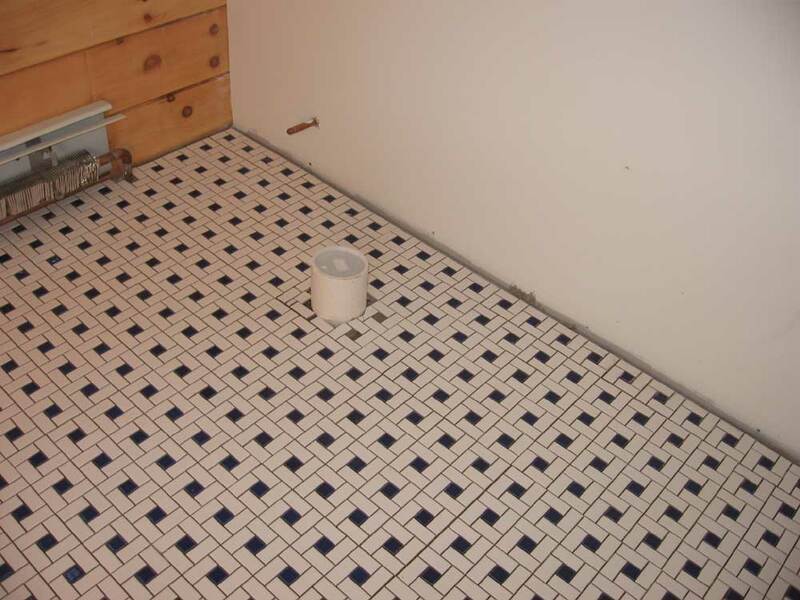 I'll need to pick up about 20 more sheets to finish this bathroom, though, but I need to get that done before Oct. 24, when the bedroom carpet arrives. I ran out of steam by about 5:30 and called it a day. I had hoped to install that strip at the top, but I just couldn't bring myself to fight another piece. No updates till Monday, folks. See you then! 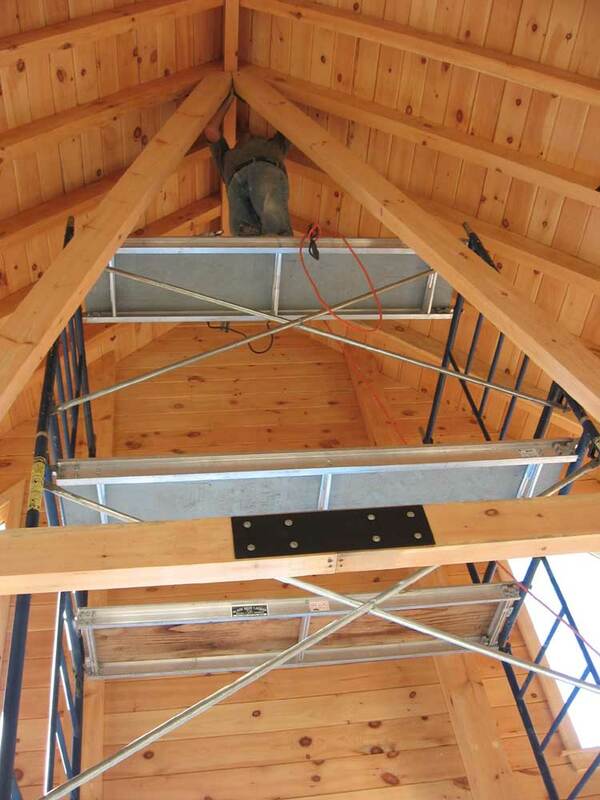 I had a little time this morning before Bob arrived to start installing the sheets of Homosote material on the loft deck. 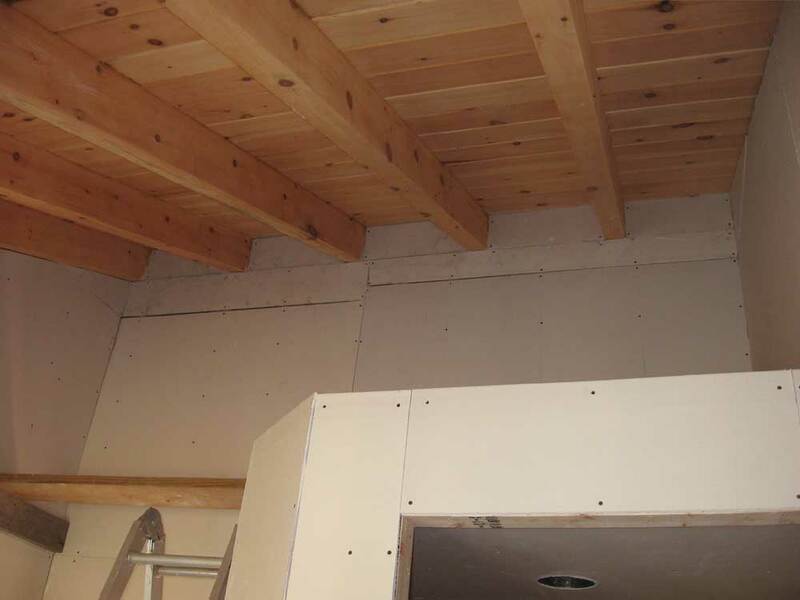 The purpose of this material is to acoustically insulate the hardwood flooring planned for here from the ceiling boards and joists beneath, so that every footfall doesn't creak and echo through the house. 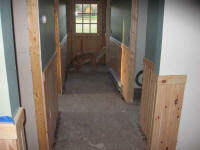 We only needed it in this small area since the remainder of the upstairs is either carpet or tile. I installed three full sheets of the Homosote in a bed of construction adhesive, nailing it to the joists beneath and being careful near the wall to avoid the wires running to the kitchen lights. But Bob arrived earlier than expected, so this was all I got done at this point. 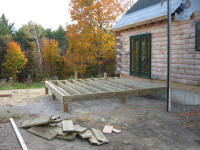 We continued with the deck framing outside. 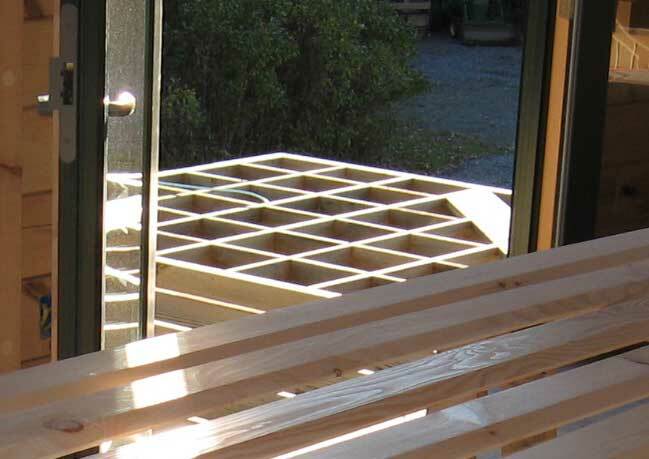 I installed some solid bridging in the screen porch deck frame while Bob did some layout, and then we used Bob's transit level to determine the height at which the final deck posts needed to be cut--and then cut them off at this height. 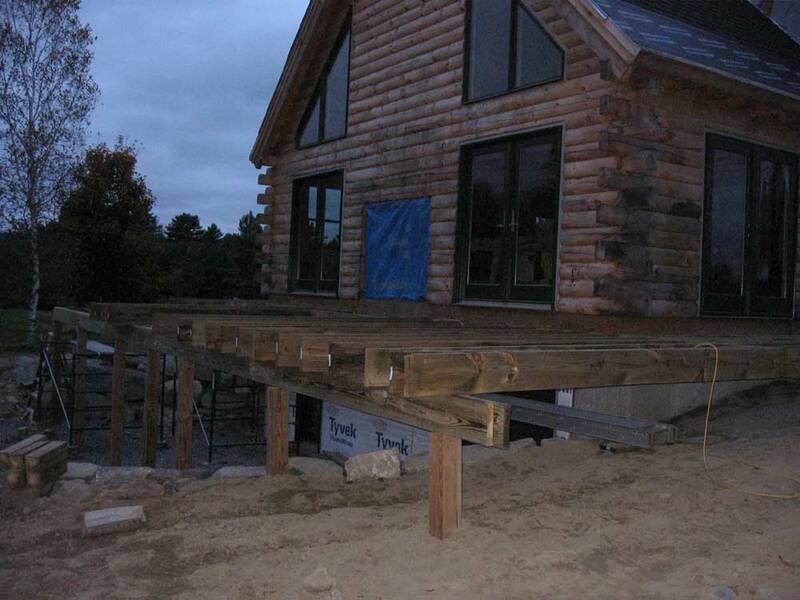 Using the same basic procedures outlined during our framing of the front porch, we built a carrying beam and then started installing the 12' joists for the large deck. Unfortunately, we ran out of material before we reached the end, for reasons yet to be determined. 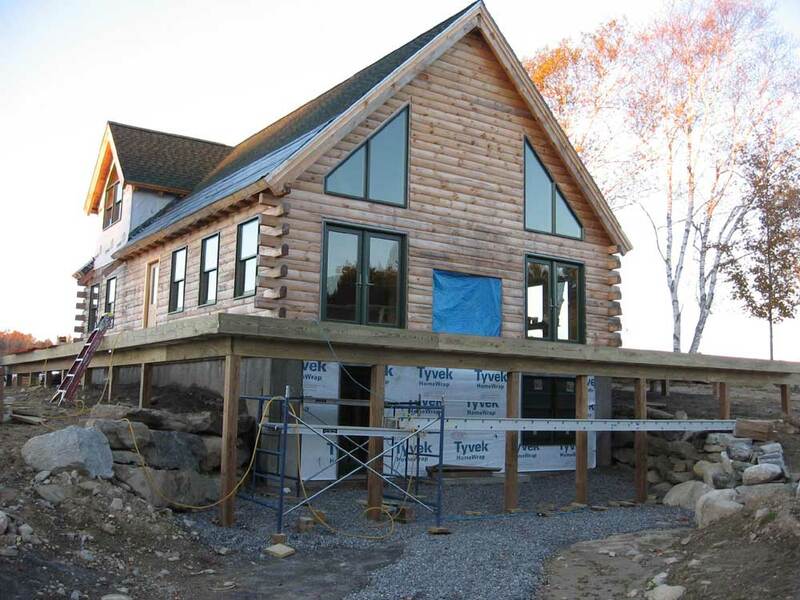 Apparently, the amount of material spec'd for the job by the log home company just wasn't enough. Sorry...it was getting dark by the time I got around to taking these pictures of the decks! It was about 11. We discussed a plan of attack for a while, and considered going to pick up material immediately, but it was enough pieces that it would have been tough to fit even on Bob's truck, and eventually we decided to order it from Moose Creek. Factors in this decision also included the fact that my cabinets were due any time this morning, and that of course Bob had lots to do on Will's house. With lousy weather forecast for Thursday, and since we had plans to be away during the weekend, it just made sense to get going again on Monday, armed with the material we needed. I took an early lunch after cleaning up the tools from outside and made some phone calls related to the house. 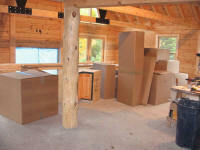 At noon, the truck carrying my cabinets arrived, and after unloading the large pile I got right to work on installation. Two of the base corner cabinets were too wide to fit through the door, so we had to take them around through the double doors at the screen porch. It was great that the cabinets came a day early, as it meant that it was likely that I'd have the whole kitchen installed before we went away on Friday morning. That will make for a much happier and more relaxed Tim during our mini-vacation! 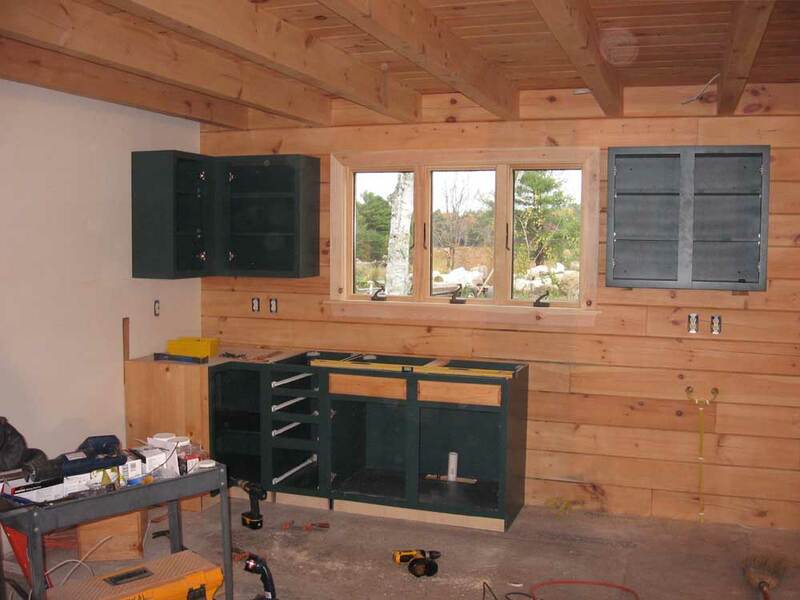 We chose semi-custom cabinets built with green-painted maple frames and plywood boxes, with natural pine raised panel doors and solid maple dovetailed drawers. 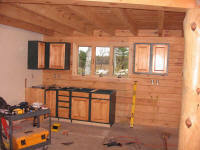 As I installed more and more of the cabinets, I became very pleased with the look. 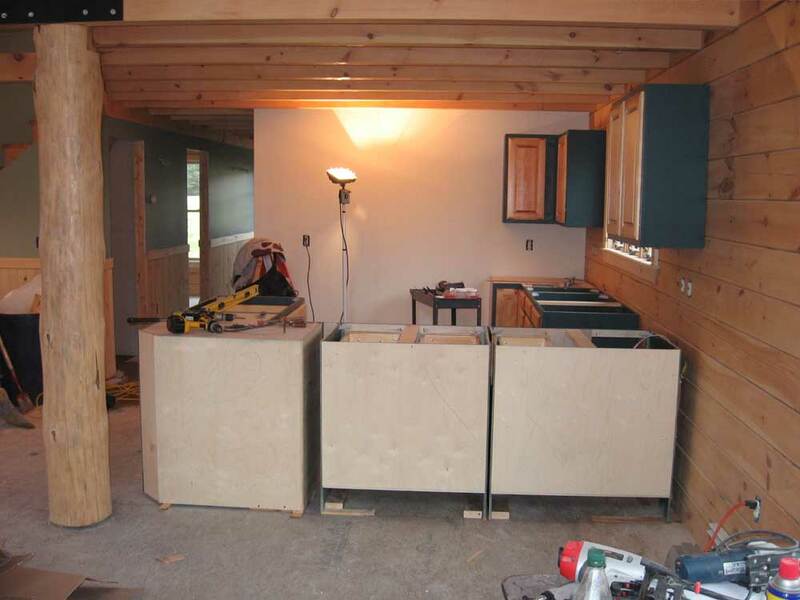 The cabinets looked fine one by one on the ground, but as they became incorporated with the walls and surroundings things really started to come together. An all-wood cabinet might have tended to become "lost" on the log wall, and the green frame really set them apart, while the wood doors kept them from appearing plain or bland. I installed the wall cabinets first; there were only three, not including the small one over the refrigerator, which wasn't critical to install right this moment. After determining the high point of the floor, I measured up 54" and drew a level line around the room at that height, which represented the bottom edge of the wall cabinets. 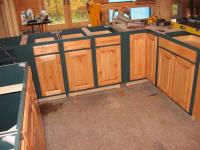 Starting in the corner, I installed the three cabinets. I removed the doors to make the cabinets a bit lighter, and to protect the doors during installation; this was easy because the European hinges simply snap apart and together. The cabinet company didn't provide installation screws, annoyingly; every cabinet I've installed in the past has had a little packet of screws included. Fortunately, I found some stainless steel pan head screws in the boat shop that would work, so I was back in business without needing to waste half the afternoon driving to buy some. 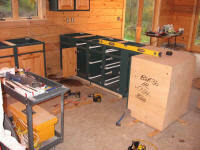 During the remainder of the afternoon, I installed the first row of base cabinets, starting in the same corner. I spent quite a bit of time ensuring that the first cabinet in the corner was plumb and level before continuing, since the levelness of the remaining cabinets would all depend on this first one. 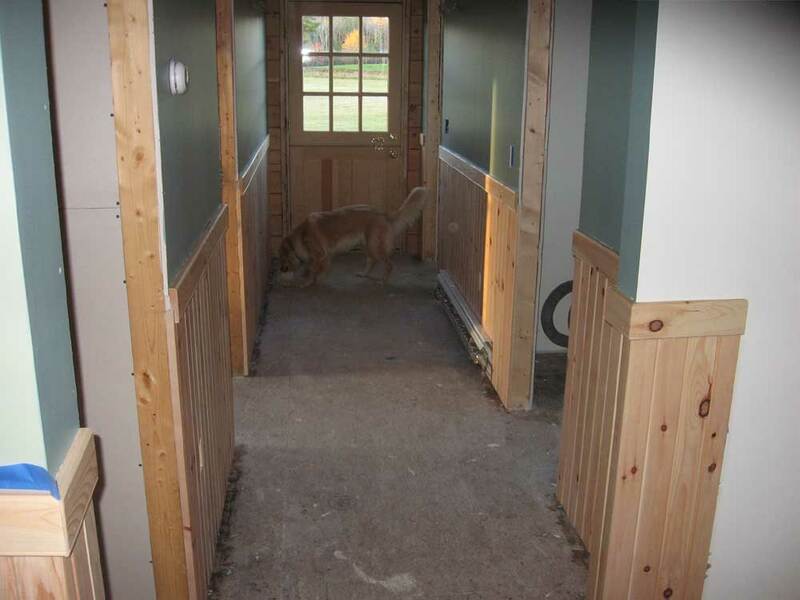 Then, I continued down the exterior wall, screwing the cabinets first to each other through the face frame, and then to the wall once I had a line of them in place. 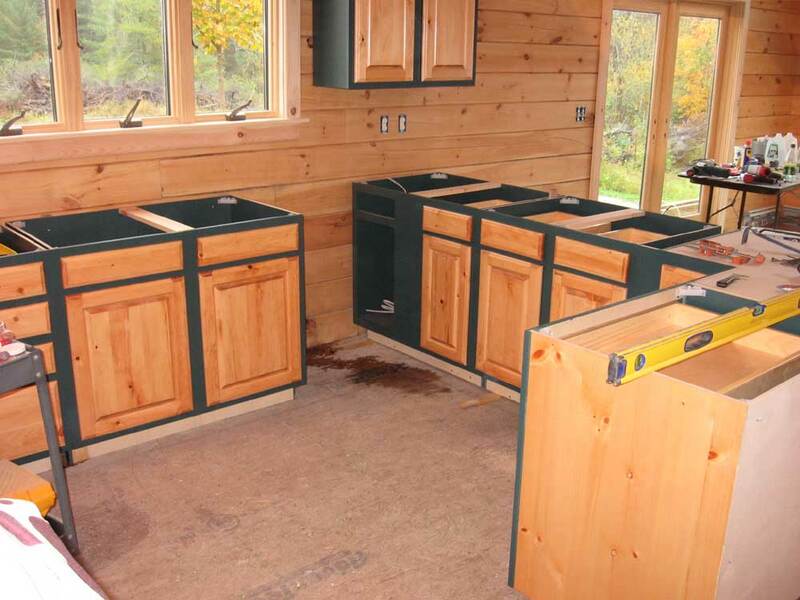 There were only three cabinets until the open space for the dishwasher, to the right of the sink. None of the corner cabinets feature Lazy Susans, since we have yet to have a good experience with these unreliable space-wasters. Instead, we chose regular corners or blind corners with shelves--perhaps less useful in some ways, but reliable...and besides, we have an 8'x9' dedicated pantry just around the corner. I placed the first cabinet for the peninsula in position, but didn't secure it yet, since I needed to add blocking to the floor sot hat the cabinets would be able to be screwed in place. At this point, I called it a day, feeling good about my progress and sure that I could easily finish the installation tomorrow. 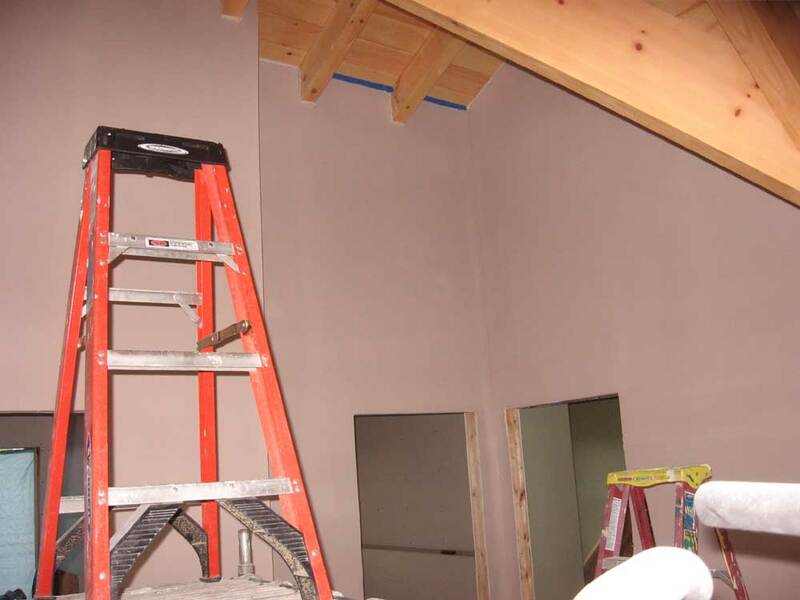 I had time this morning to apply the second coat of mud to the sheetrock in the bathroom (just the top areas; the lower sections will wait till the top is done). Then, I had just enough time to run down and pick up a spec sheet for the porch materials that I needed before Bob arrived around 8. We got right to work on the front porch frame, and before long had the ledger board secured to the house. 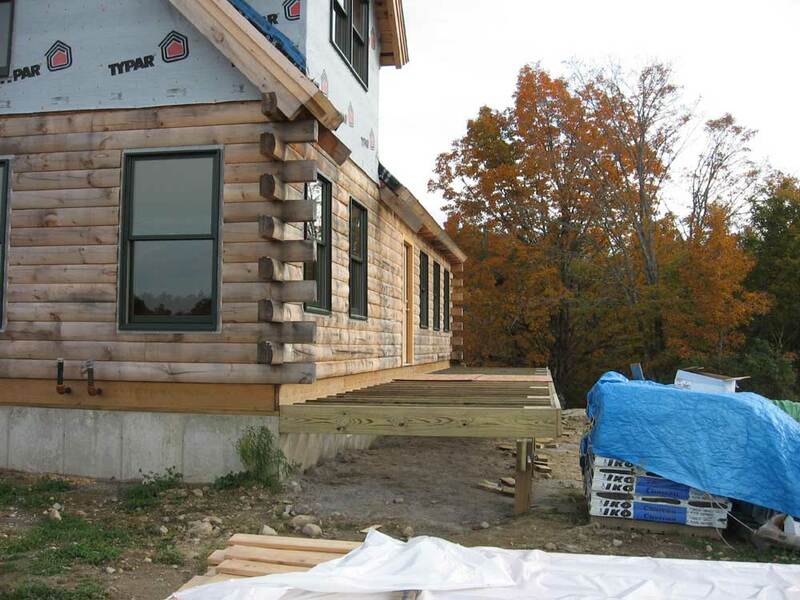 The ledger board supports the joists, and we secured it 7-3/8" below the bottom of the first log, to provide the proper step-down. 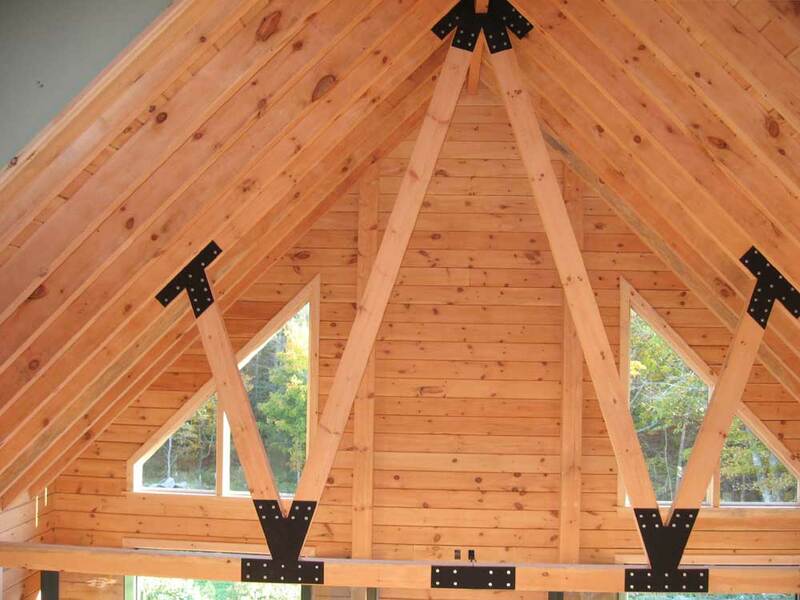 This meant that part of the ledger was up in the house framing, and part overhung the foundation. 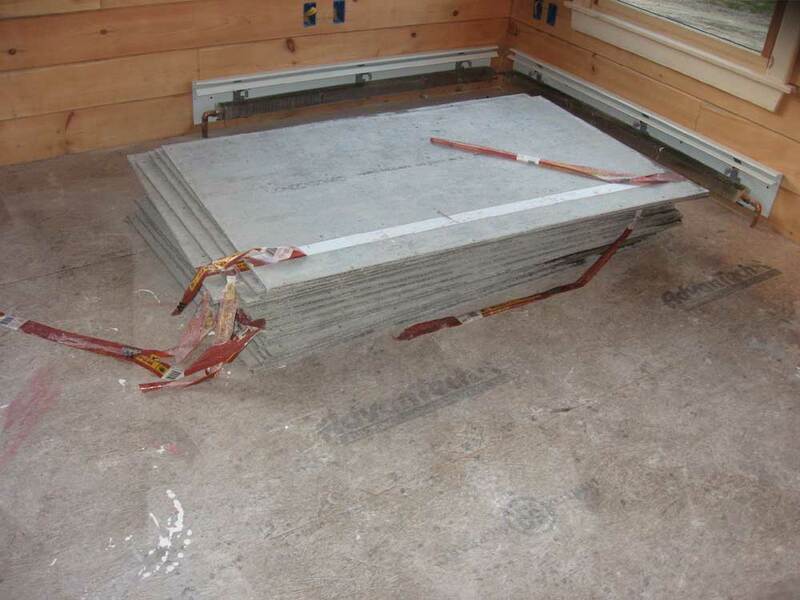 We secured it to the house box sill at the top with 4" Tap-Con screws, and every so often the to concrete foundation with special concrete lags. 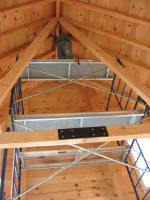 Next, we built the carrying beam, on top of which the floor joists would bear. 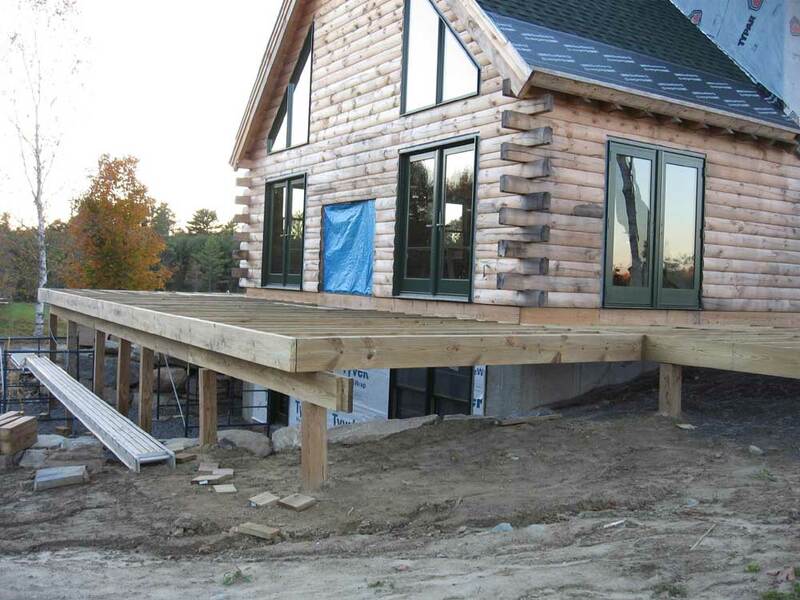 Way back in May, we had installed the porch posts with this beam in mind, and had set them 1' in from the outside edge of the porch. 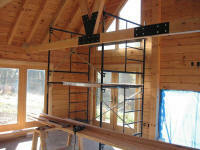 We built the beam from three layers of 2x10, nailed together. 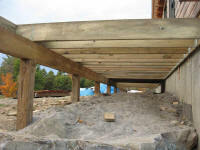 This photo shows the beam beneath the deck frame. With the beam complete, We cut 8' joists roughly to length from 16' 2x10 stock, and Bob toenailed them to the ledger board. I followed behind and installed joist hangers, and when they were all nailed Bob measured out the exact distance at each end joist, snapped a chalk line, and cut off the excess. 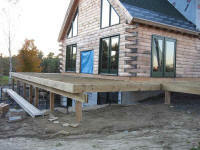 Then, we installed a double box sill outside of the joists, completing the basic porch framing. In the afternoon, we repeated the process on the deck for the screen porch on the back of the house, figuring that since the decks were all the same height, it made the most sense to build these two first, and then connect them with the large deck off the gable end of the house--which was much higher in the air and more difficult to properly determine heights, etc, so with the two adjacent decks built, it would be a simpler matter of connecting the two across the wide span. 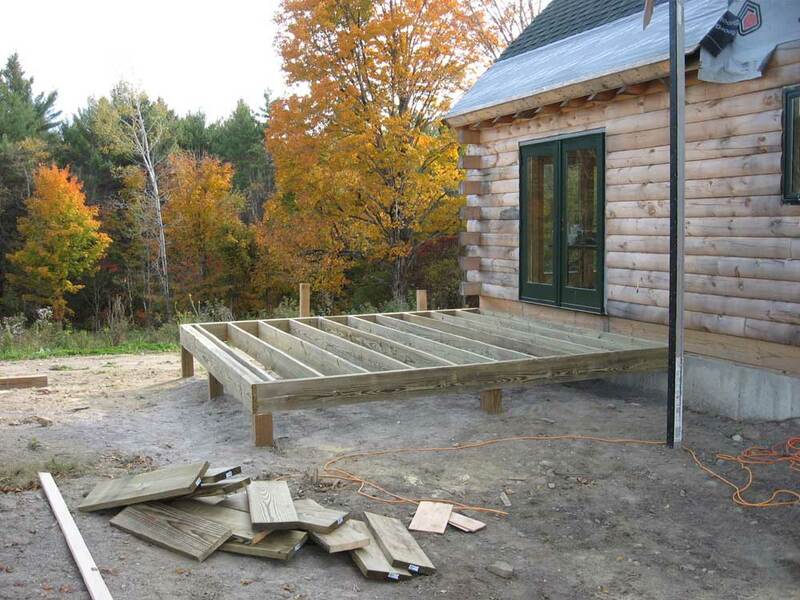 We managed to get the screen porch deck framed up before Bob had to leave a little after 3. After Bob left, I cleaned up a bit, and then went inside and mudded and taped the lower portions of the closet upstairs, which took the rest of the afternoon. It looks like the cabinets are coming tomorrow instead of Thursday, so that's good news! Can't wait to see them. I knew Bob was on his way sometime this morning with pump jack staging to set up on the back of the house, and I figured he'd arrive a little later in the morning, so I filled the first couple hours of the day with some smaller projects. 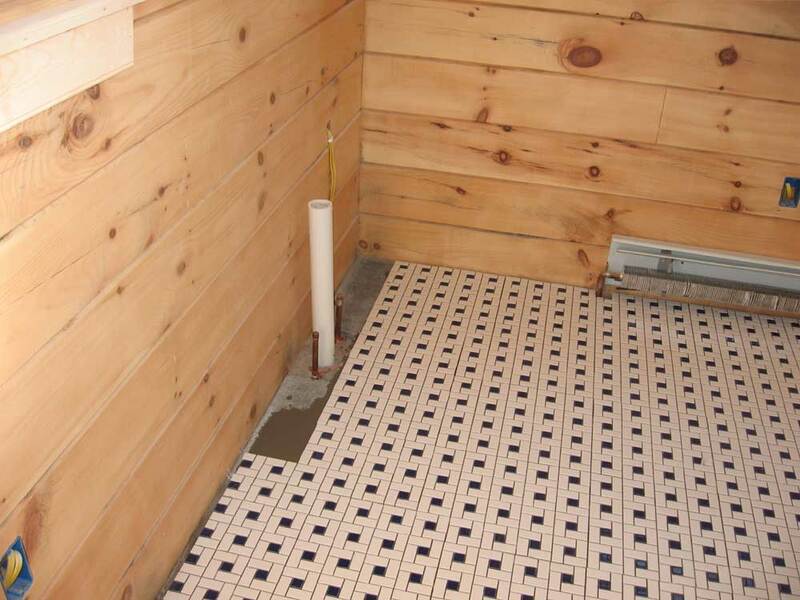 First, I mixed up a small amount of mortar and filled in some of the space beneath the future vanity cabinet in the bathroom with the leftover tile, and also filled in some small pieces around the toilet pipe. I didn't worry here about whether the pieces fit the pattern or not, since they'll be hidden, but I wanted the area to be as level as possible, and didn't want to have to use excess grout later. Once that was done, I wired up several of the outlets on the first floor. I didn't have any cover plates in stock, but I worked on the outlets in the kitchen, so that they'd be done before the cabinets arrive on Thursday. By approaching the electrical trimout in a piecemeal fashion like this, I can avoid feeling overwhelmed by the number of outlets and switches in the house. Bit by bit, I'll get it done. Bob arrived, and after we unloaded and set up the pump jacks, we turned our attention to the bow window in the upstairs bathroom--finally! We prepared the window by removing the strapping that was nailed to the bottom for shipping, and then I removed the tarp from the opening upstairs. We put the window on the staging and then pumped our way up to a workable height near the window opening. 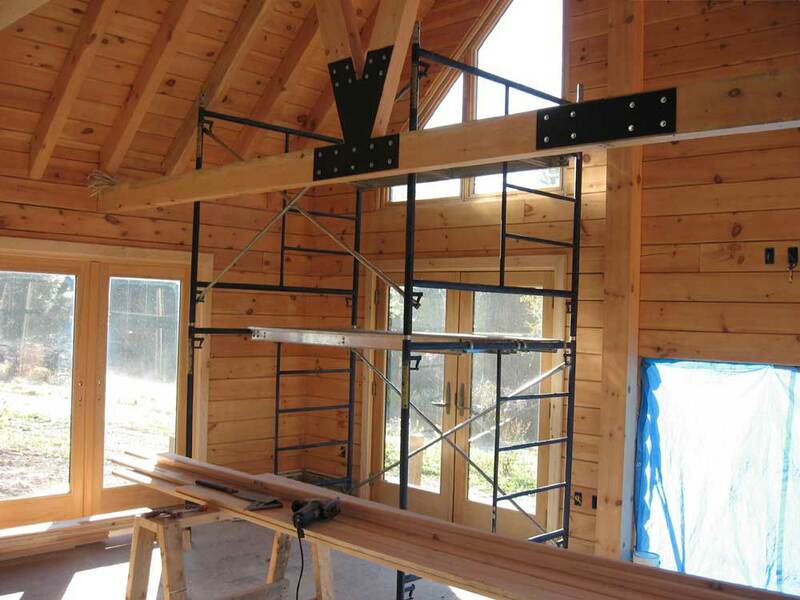 In short order, we had the window in the opening, and after checking level and the window positioning, I nailed it in along the installation flanges outside. 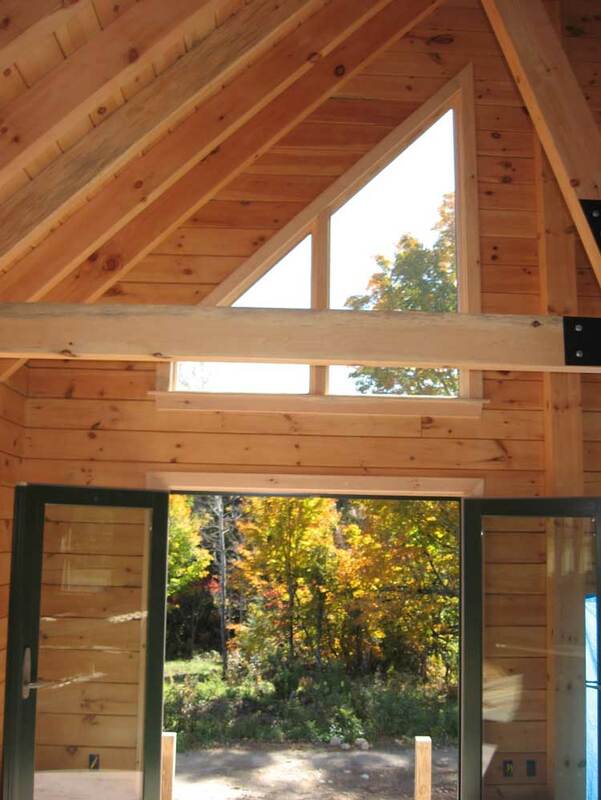 The bow means that the window will require a small roof above, which I'll build a little later. While the pump staging is in place, I expect to complete all the rear window trim and siding, and other chores on the outside. In the meantime, there was a largish (3/4") gap between the top of the window and the opening, so later in the day I installed some of the rubberized self-adhesive flashing material over this area to keep water from blowing through the opening. We spent some time discussing the porch and deck construction, and soon determined that we needed some lags and fasteners to get started. So Bob left to pick those up, and to spend the remainder of the day working on his son's house, which he has been building in his "spare" time since about January. This was fine with me, since I had plenty to do. 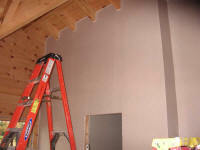 In the afternoon, I worked on the final pieces of sheetrock in the upstairs bathroom. First, I had to set up some sort of staging to reach the area. I could reach half of the last section from the platform on top of the shower enclosure, but the other side was inaccessible; with the small floor space, regular staging wouldn't fit, and ladders didn't work either. 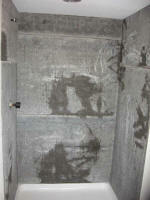 Eventually, I screwed a 2x6 to the wall and ran a plank across from the top of the shower platform. I cut and fit the various pieces, aiming for tight fits along the ceiling and rafters to avoid the need to edge tape all those seams, much as I did in the closet last week. The black fingerprints and mess all over the pieces is residue from the chalk line that I used to snap a straight line for cutting. These pieces represented the end of the rock hanging, finally! There was no more to be done. 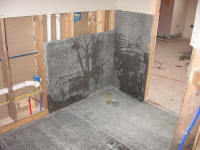 Never mind the cement board that I have to install in half the upstairs bathroom. I take my small victories one at a time! Once I had all the pieces installed, I mudded and taped the area, and then called it a day a bit early so that I could finish some field mowing outside. It was a glorious, summerlike day, and I felt I needed to take advantage of it, if only briefly, to get this outdoor work done. 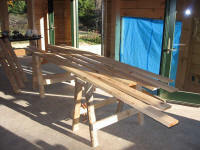 I started with the second coat of polyurethane on the trapezoid window trim, first one side, then the other. This went fairly quickly, and it was good to get it done. Later, I'll have to climb back up wash these windows, but for now my work here was done. 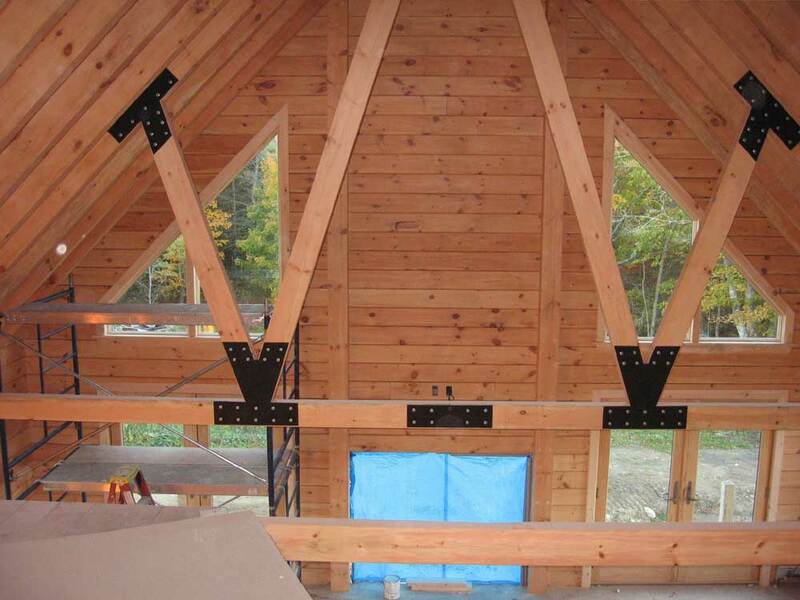 Next, I moved the staging to the center of the truss, and set up a third level so I could reach to the top and install the final steel plates. I did the first side--the side on which the staging was already set up, then had to dismantle all the staging down to the first level so that I could drag it beneath the truss and then set it up on the other side to install the final plate. Thanks to my friend Nathan, who happened to be around to work on his boat and made the mistake of coming up to the house at this point, and therefore could help me move the staging from one side to another. This certainly made the process easier. He also took this "action" shot of me installing the first plate. 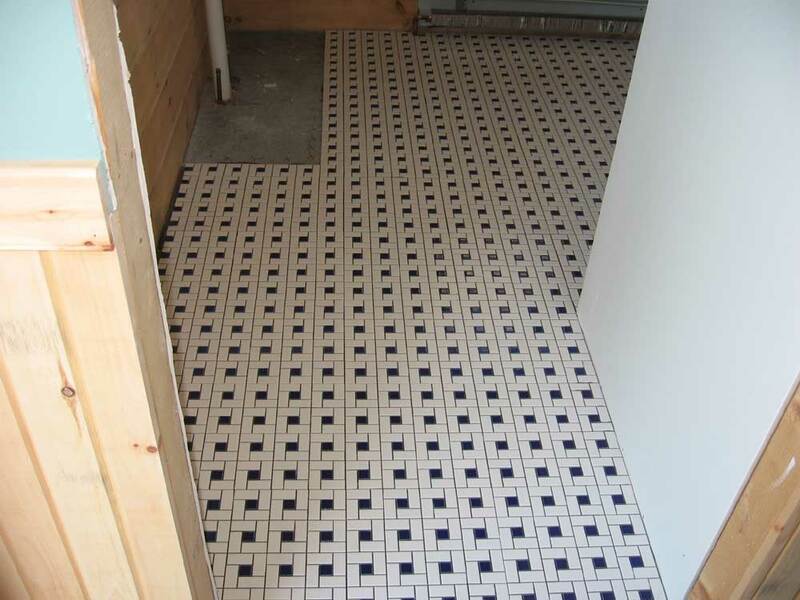 After a break to help Nathan move and set up some wooden staging around his boat--staging that had been up at the house all summer and now needed to be moved down to the shop--I started to work on the floor tile in the downstairs bathroom. First, I laid out a dry run to determine how the tile sheets would fit between the walls and so forth. We chose a mosaic tile in a pinwheel pattern, which came pre-attached in 12" x 12" sheets, so it seemed that cuts might be at a minimum. 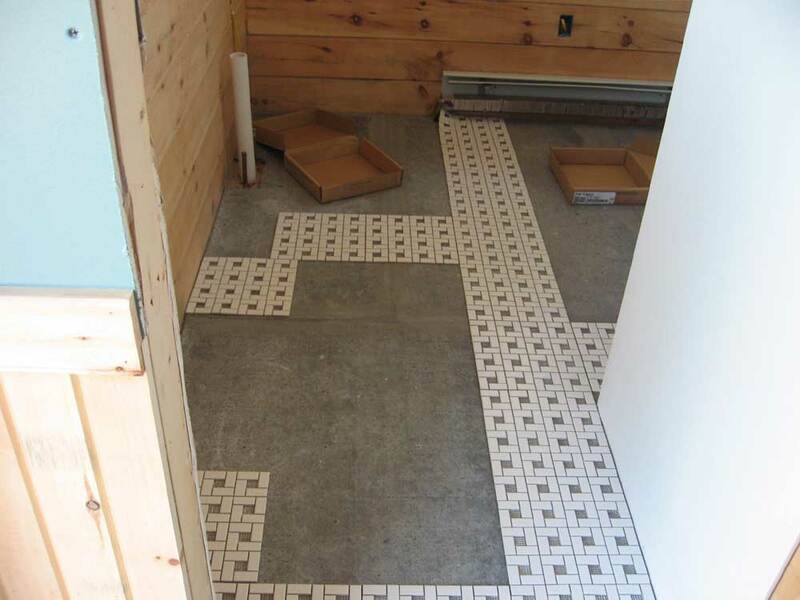 The tile we chose happened to be called Chloe, which seemed appropriate since we have a dog named Chloe; in addition, the pinwheel pattern was reminiscent of some vintage tile that had been in Heidi's house growing up...though that tile was pink! As it turned out, I had to cut the sheets along one wall, partially cutting through the tiles to remove about 1" from the overall width of a sheet. I used a small borrowed wet saw for this. 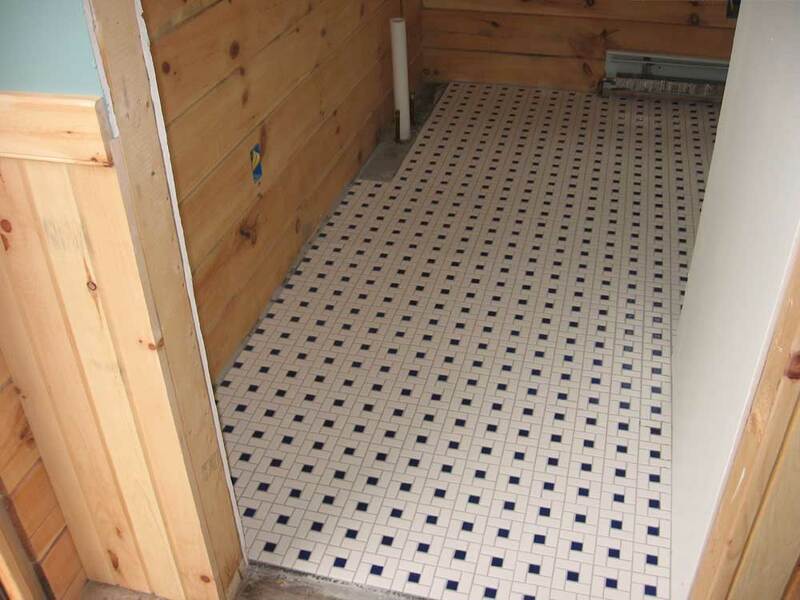 I cut enough of these sheets so that I would be all ready when I began to set the tile, and then drew some layout lines on the floor to help me align the tiles when I began to set them. 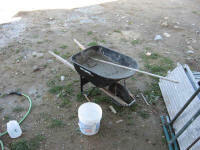 Finally, I removed the dry run tiles and got ready to prepare the thinset mortar with which to secure the tiles. I mixed the mortar in my wheelbarrow, then transferred it to a bucket to bring into the house. 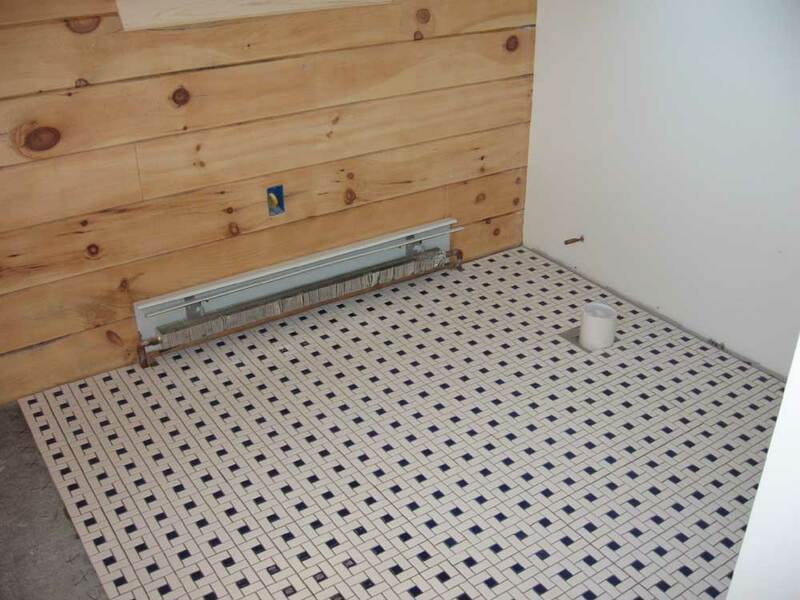 At first, I used 1/4" square notch trowel to spread the mortar, but it was too heavy for the small tiles and caused excess mortar to squeeze between the tiles and into the grout lines. Later, I switched to a trowel with a smaller notch, which worked much better. The pinwheel design incorporated a colored dot in the center. Unfortunately, these dots were sold separately, and did not come pre-attached to the sheets. I was well aware of this at the time of order, but somehow the enormity of the task of installing these small 1" squares remained lost on me until I began to actually install them. The sheets of pinwheel tile had gone down very quickly, but I soon discovered that with 16 of the colored dots in each square foot, progress would be slow. 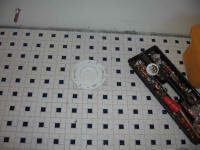 I plugged along at the task, and eventually filled all the holes in the first group of sheets that I had installed. 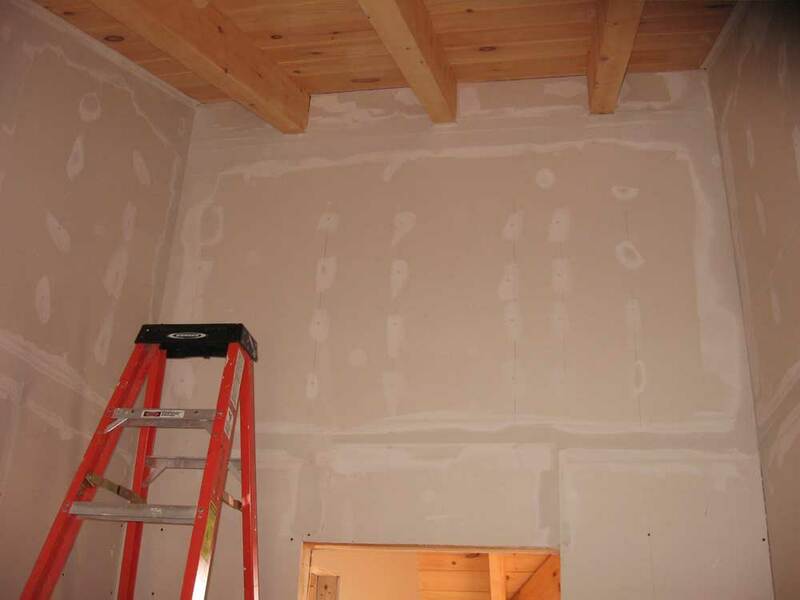 I filled in some smaller strips along the wall, and then spread more mortar--this time in a smaller area. Despite the small size of the room, completing the floor tile out to the door (I began in the far corner, of course) took several hours. I would be less than forthright if I said that installing the dots wasn't tedious. I finished up around 4:30. 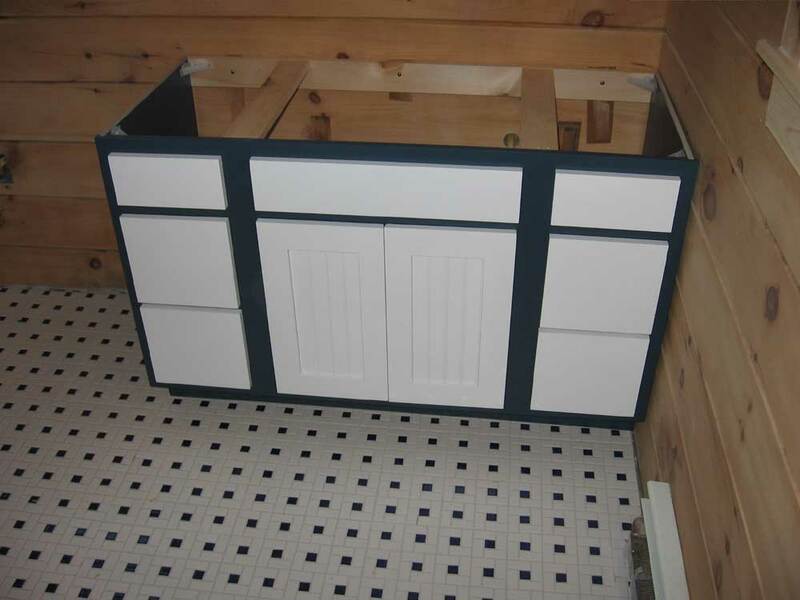 I left the space beneath where the vanity will go free of tile, since I wasn't sure we had enough of the tile go continue beneath the cabinet. As it turned out, I ended up with 5 spare full sheets, or 5 square feet. 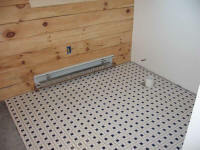 When the mortar cures, I will likely install the additional tiles in the vanity area. I don't know how many dots I used, but I had to open the final box in order to get three additional dots that I needed to finish the floor. By the time I finished cleaning up my tools and the mess, it was about 5:30. The floor looked great, though, and was well worth the effort to install. 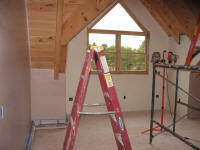 I began this morning with the primer in the upstairs closet. 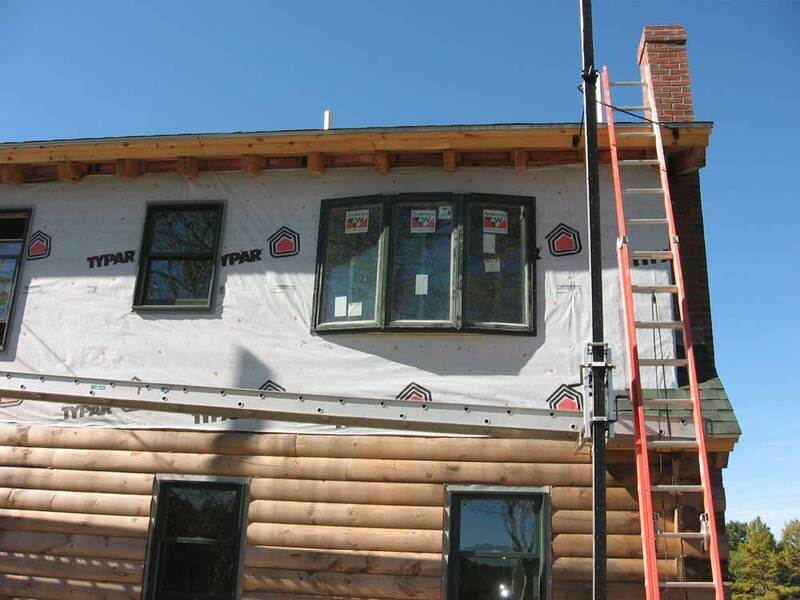 I applied my usual coat to the newly-mudded areas, and then, while I waited for the primer to dry, I brought two sections of pipe staging into the house and set it up beneath one of the trapezoid windows, as trimming out these windows was to be the major project of the day. 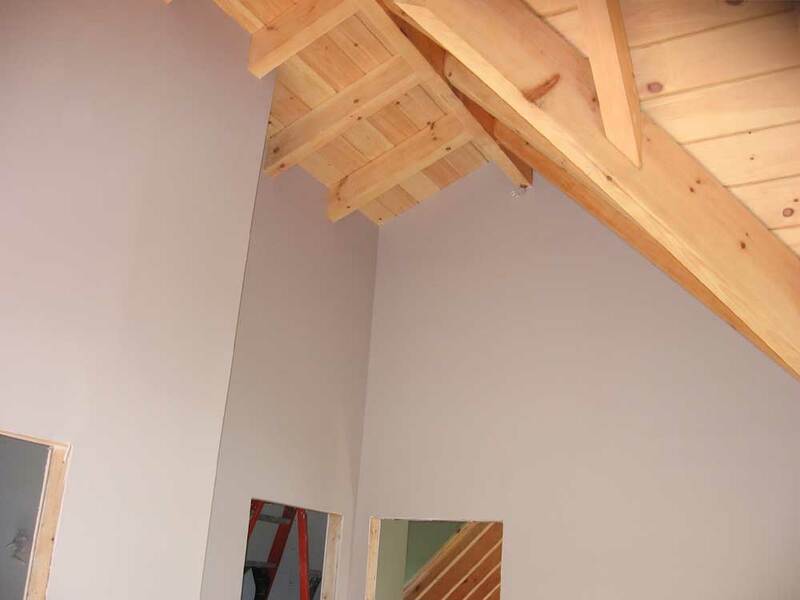 By the time I had the staging set up, the primer was dry, so I applied the first coat of finish paint to the area--the same Temperate Taupe as used in the adjacent bedroom. 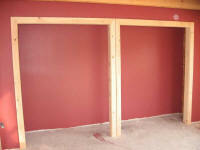 Later in the morning, after an appropriate cure time, I applied the second coat of paint, completing this area. Of course, I still had to mud and tape the lower 8' of the walls in the closet, and then prime and paint them, but completing the tall areas and those around the rafters seemed like a milestone somehow. 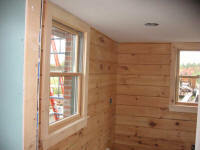 After the first coat, I turned my attention to the window trim. Accessing the trap windows from the staging certainly made life easier, but it meant that I had to do a lot of up and down clambering during the day, which made each step in the process take that much longer. Forgetting the tape measure, or a pencil, or the right piece of trim, or what have you on the ground or on the staging, when I was at the opposite location, meant additional trips. So did each minor adjustment of the cuts. The long and the short of it is that, other than completing the second coat of paint on the closet later, the window trim represents the entirety of my work today. 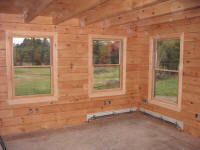 I started with the extension jambs, which were required for these windows. For weeks, I had been looking at the dizzying array of extra pieces and jambs down in the basement, unsure of what the purpose of each was. By now, though, having completed most of the windows, it was easy enough to find the necessary pieces by default. 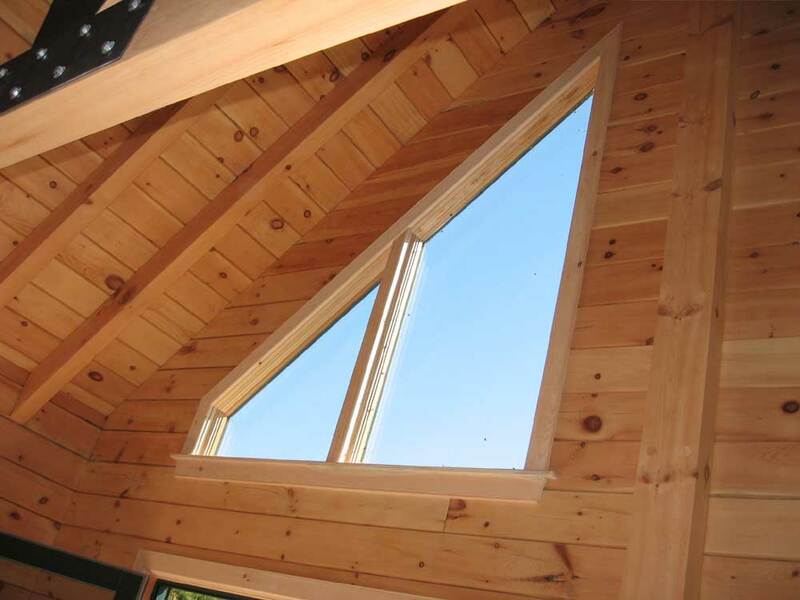 Since each large trapezoid unit is actually two smaller units mulled together in the center, each window required two full sets of extension jambs--four pieces per glazing, or eight total for each of the two windows. 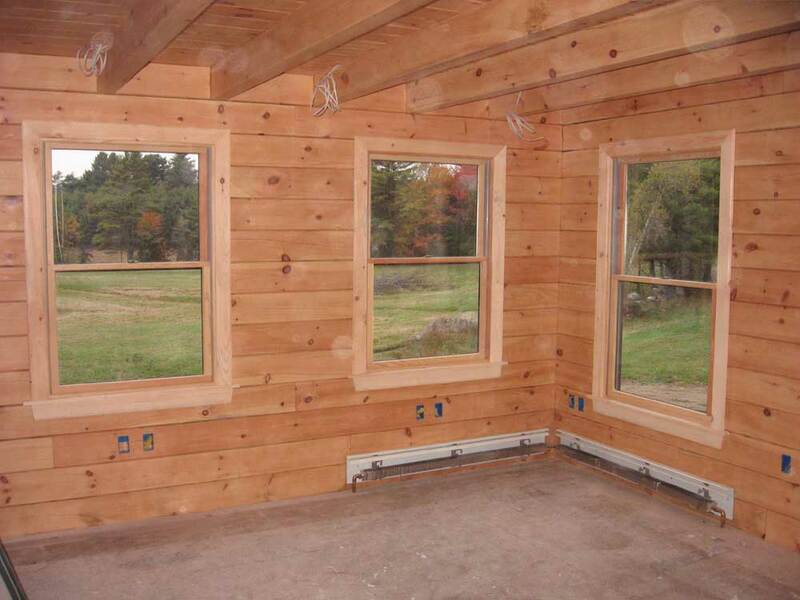 Unlike the regular, rectangular windows, the extension jambs were not cut to size for these windows; each piece was overlong, so in order to fit them I had to cut each to size. I finally sorted out which pieces were for which side of which window, and set aside the 8 pieces for the second window to avoid confusion. (You, dear reader, are probably thoroughly confused yourself by now.) But other than the many trips up and down the staging required, the extension jambs went fairly well, if over an overly long time period. 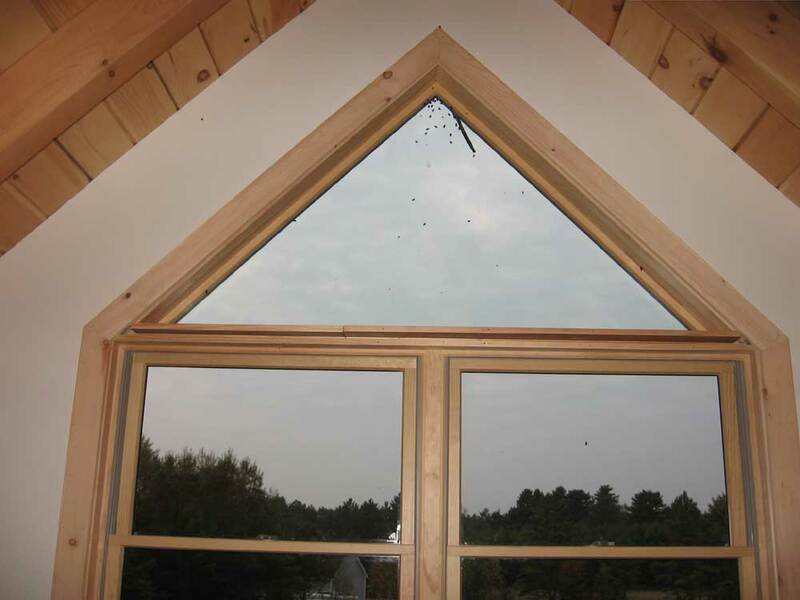 The extension jambs feature a tongue on the inside edge that fits into a groove milled in the window, which ensures proper alignment. On these windows, the tongues fit securely in the grooves (which wasn't my experience elsewhere), and I secured them with 2-1/2" nails from my finish gun. 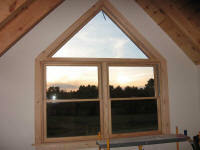 Next, I installed some ogee trim pieces around the inside perimeter of the windows. These pieces covered the seam between extension jamb and the window jamb itself, and dressed up the opening. These came pre-cut and -mitered, so installation was straightforward once I determined which piece went where. I tacked these in place with my brad nailer. Now, it was time to move on to the window casing. I began, as usual, with the stool, after some consideration. With these windows high on the wall, I considered eliminating the stool, but decided instead to remain with a consistent look throughout the house. I do think windows look dressier and more finished with a stool and apron at the bottom, rather than just a piece of casing. Of course, some fool forgot to add the proper amount of width to the stool, which meant that it wasn't long enough. I fired that guy, and went down and recut a new stool properly myself, having double checked the measurements and added the correct amounts for overhang. With the odd shape of the window, I had to think for a time about how to deal with the joints between the top casing and the side casings. 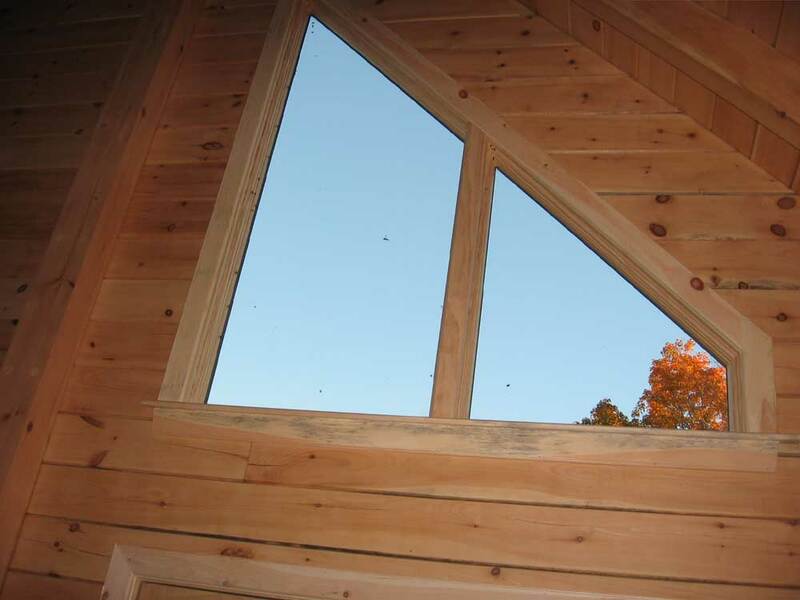 My miter saw wouldn't adjust to a steep enough angle to properly bisect the acute angle at the topmost corner of the window, which would have been the ideal method. While I could have bisected the angle at the bottom corner, it didn't make sense to do the two ends differently, so I chose instead to let the side casing run past the top casing; with the windows so high on the wall, the end grain at the top of the side casing would never be seen. I discovered after I had cut the pieces to fit that this method brought with it one additional complication: my pre-milled trim, with the bead and chamfer edges, wouldn't work correctly where the side casing ran past the top casing, as the chamfered edge created an unwanted decoration at the seam between the two pieces. Of course I discovered this after I had all the pieces cut and fit in place. To correct this, I removed the side casing and milled additional pieces with only the bead detail. After I cut these to fit properly, I marked where the side intersected with the top on the inside edge, and then milled the chamfer on the inside, stopping at that point. All this required numerous trips up and down the staging, of course. I also milled the bead detail along the end grain of the side pieces, so that it continued around the entire perimeter of the window. Overall, nice mitered joints would have been easier and better, but I wasn't about to try cutting them by hand for that top corner. I was pleased with my solution, and it looked good from ground level. I finished up the window trim on the first window with the apron beneath the stool, and then a mullion piece that covered the joint between the two halves of the window. I found some Andersen stock in my collection that fit this area perfectly, other than requiring a miter cut at the top edge, and I used this to cover the seam. Here, there was no avoiding the "meeting of the chamfers" at the top, so I milled a chamfer at the top edge of the mullion to match the one on the upper casing. This all took until about 2. After a brief break, I moved the staging and repeated this process on the second window, though this time I knew what I was doing and avoided the confusion and mistakes of the first window. The second one went much more quickly, and I finished in time to apply the first coat of poly to both windows; in the morning, I planned to do the second coat, after which I'd no longer need the staging to reach the windows. I spent the entire morning installing the cement backer board in the downstairs bathroom, on the floor and then in the shower enclosure. 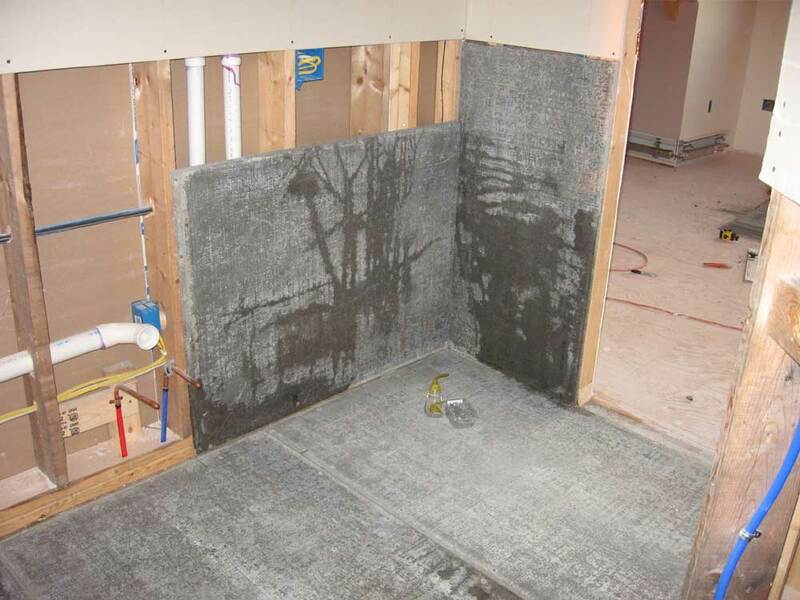 Cement board comprises a 1/2" layer of nasty, porous cement sandwiched between layers of fiberglass mesh. A 3x5' sheet weighs 50 pounds and emanates a rank odor. 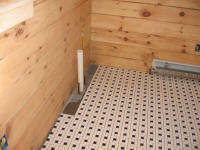 I don't much care for working with the stuff, but it makes a good substrate for tile--both stable and water resistant. To cut it, I scored one side with a utility knife, like drywall, and then snapped it at the score, finishing up by cutting the mesh on the other side. For cutouts in the center of a sheet, such as around the plumbing in the bathroom, I scored both sides of the sheet around the opening first, then used a hammer to break out the piece. Fun stuff, and time consuming, too. And the crumbly cement made a wonderful mess, which I was constantly cleaning so that no little bits of crumble ended up beneath one of the boards on the floor. 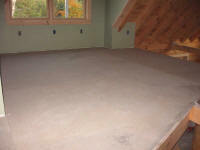 I secured the sheets to the floor and walls with special screws designed for this purpose. 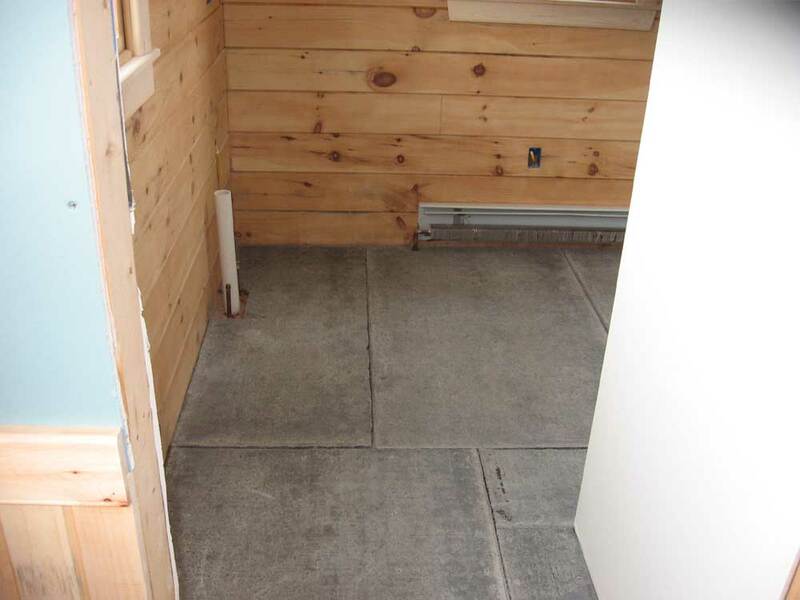 They worked OK on the floor, where I could put my weight behind the screwgun, but on the walls the screws were a real pain to get started; as crumbly as the cement board seemed, it sure was hard wherever I needed to drive a screw! Later, I used some roofing nails to secure a drywall corner bead at the outer edge of the shower, and they went right in; I should have used these to secure the sheets instead. It was lunchtime when I finished installing the sheets--I think I used around 10--and cleaned up the remaining mess, but then I wasted (spent?) an hour chatting with Bob, who was acid washing the new chimney and picking up the remaining bricks. With the chimney officially done, I started the boiler again--it hadn't been run since its initial installation test. I also fired up the Boiler Mate hot water maker, which had never been run before, and was soon rewarded with hot water out of my tap. Once I confirmed its operation, though, I turned it back off, since I have no fixtures with which to use the hot water, and saw no need to continually heat the water just yet. 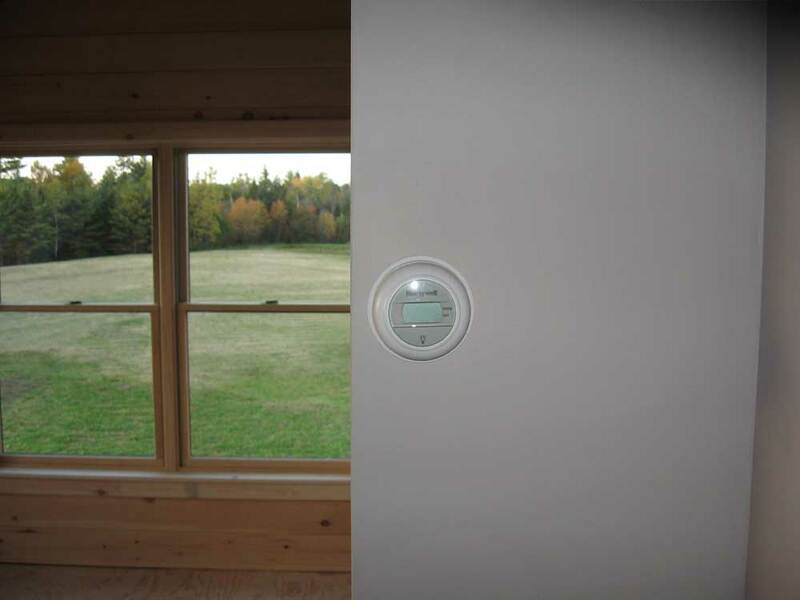 I set all the thermostats to 50° for now, since there are still a couple rather large holes in the house--the fireplace opening and the window upstairs in the bathroom. After a late lunch, I mixed up a pail of thinset mortar to use to tape the joints between the sheets, much as one would with drywall. My mix was a bit stiff and dry, but it worked for this purpose nonetheless. I installed some of the mortar on the joint, then applied a length of fiberglass mesh (same as I used for drywall), and then embedded the mesh in the mortar with a putty knife. 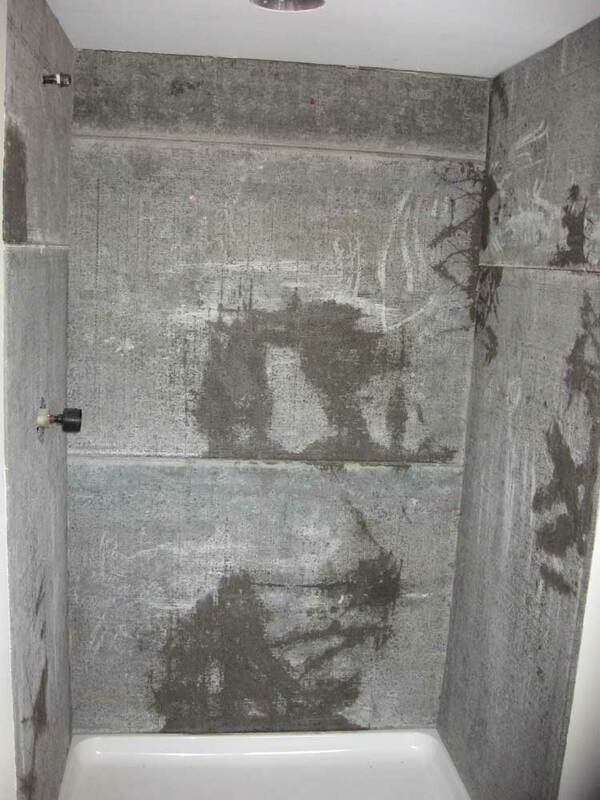 The tape wouldn't stick to the board alone in advance, like it does to drywall. Afterwards, I was sort of loose-endy, as it was late afternoon and I didn't know what to do next. I spent a little time cleaning up my work tables and moving some excess tools and equipment to the basement to clear some clutter, and also to gear up for a few upcoming projects, like electrical trimout. Then, at the end of the day, I went upstairs and sanded the mud in the closet, so that in the morning I could prime and then paint this area--and remove the staging for good, finally. Well, almost. 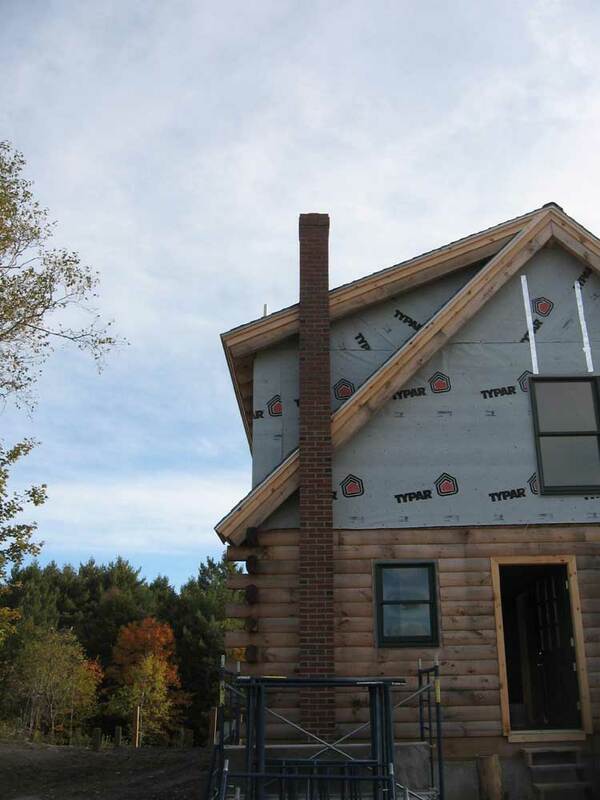 With a stack of unused staging now available following the completion of the chimney, I planned to set up enough to install the final plates on the truss, and then to trim out the trapezoid windows. 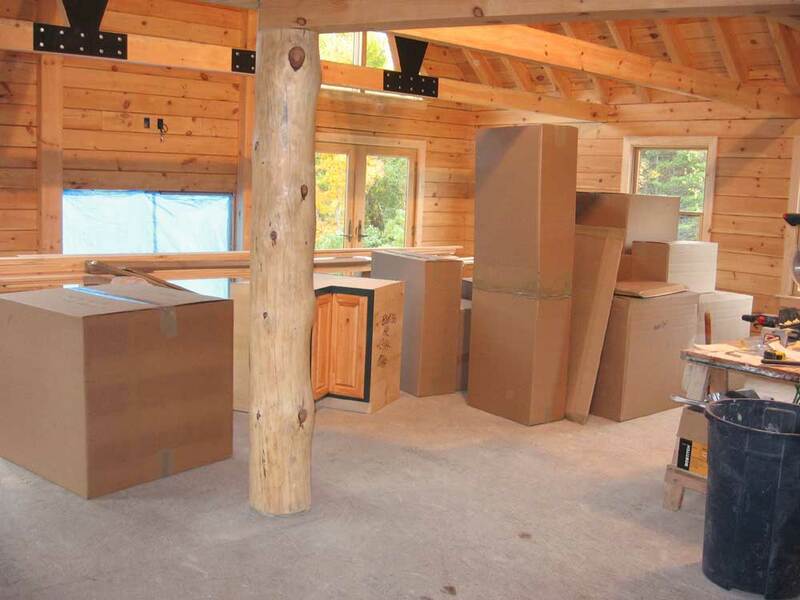 Then, I could remove the staging from the house-and just in time for true finish materials like kitchen cabinets and, soon, wood flooring. Errands--sometimes there's simply no way around them. 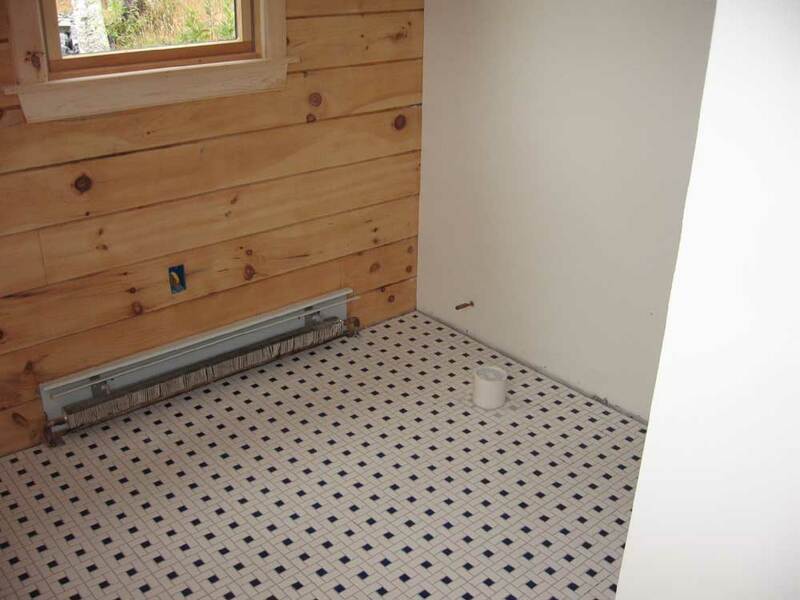 The tile for the downstairs bathroom was in, and I needed to pick up some cement board anyway, so I coordinated the morning so that I could combine these two errands--which was uncharacteristically convenient, since the tile place was right on the way to the Augusta Home Despot. 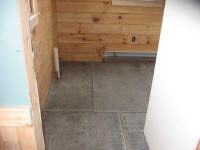 The tile store didn't open till 8, so I had to put off all the errands till later than I normally would have, but I went first to the Despot, got 20 sheets of 1/2" cement board and some thinset mortar, and then arrived at the tile place right after 8. I was back home by 8:45, and spent a while unloading all the materials. I finally got to work for real around 9:30, starting once again in the upstairs closet, where I applied the third coat of mud to the top portions of the walls. I continued with the trim on the window in the dormer. I ripped a piece of pine to 2" width and used it for the final piece in between the upper and lower windows. 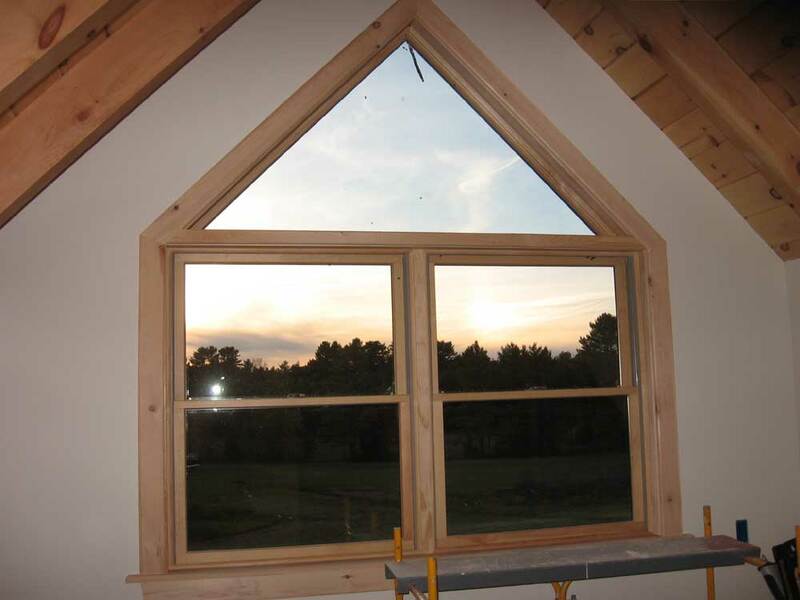 Then, I installed some ogee-type trim supplied by the window manufacturer inside the triangle window, which covered the seam between the extension jamb and the standard jamb. I had to slightly trim one of the pieces to fit, but otherwise they fit very nicely. 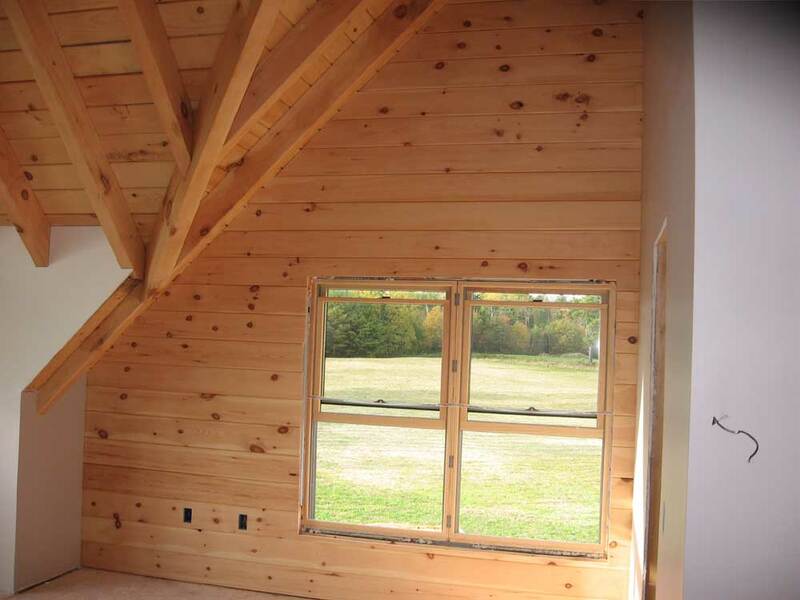 Next, I worked for a while on the trim at the edges of the dormer knee walls, similar to the trim on the bottom edge of the loft wall that I installed earlier. 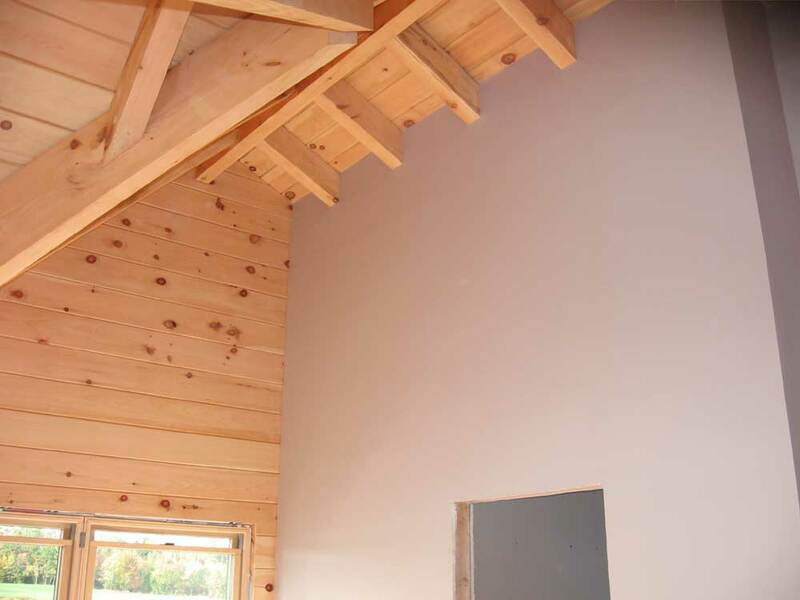 In this case, though, the top cut was going to require some careful fitting in order to mate with the myriad angles where the valley rafter, dormer rafter, kneewall framing, and sheetrock came together. I got a test piece close to a proper fit by lunchtime, but I was sick of that project and decided to focus elsewhere. After lunch, I quickly installed the thermostats, now that the walls on which they were to be installed were all painted and done, and then decided to sand the V-match in the downstairs hallway. I really wanted to get all the dusty work out of the way downstairs, and this needed to be done. I sanded all the boards with 120, which took about an hour and a half. Then, for the rest of the afternoon, I applied 2 coats of poly to the whole area. When I went to pull of the masking tape I had applied to protect the paint, I found that it annoyingly pulled some of the paint with it--even though it was low-adhesive safe tape designed just for these sorts of instances. It was puzzling because the tape wasn't even at the edge of the paint or sheetrock, since the trim covered this area. I wondered if maybe the water-based poly had softened the paint through the tape where it had overlapped...in any event, I was left with several areas that I'd have to touch up later. Just what I needed. At least the polyurethane was done! Needless to say, I won't be using that tape when I have to tape around the windows later to poly the trim. Bob Emery finished up the boiler chimney today, so I should be able to use the heat tomorrow and going forward as necessary. 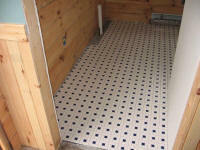 And with the tile now in stock, the prospects for a working bathroom are looming ever closer. 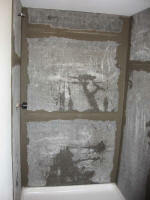 First thing, I applied the second coat of mud to the areas of the bedroom closet that I started yesterday. Once that was out of the way, I spent about an hour milling the bead and chamfer details on a dozen or so boards, since I was nearly out of my milled stock. The huge pile of blank trim stock has shrunk substantially already. 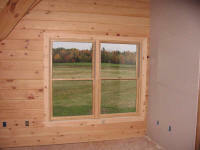 With plenty of milled material now ready, I turned my attention to the windows in Heidi's craft room. I trimmed out all four windows in the same manner as the other windows in the house. There was nothing particularly noteworthy about the process, but it was nice to knock off the final window trim on the first floor. Well, almost...the big trapezoid windows still require trim. I expect to do that early next week, or before. 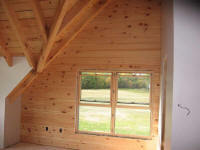 This all took me right up to noontime, and after lunch I began work on the two windows in the master bedroom upstairs. 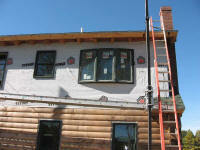 I started with the double window on the gable wall. 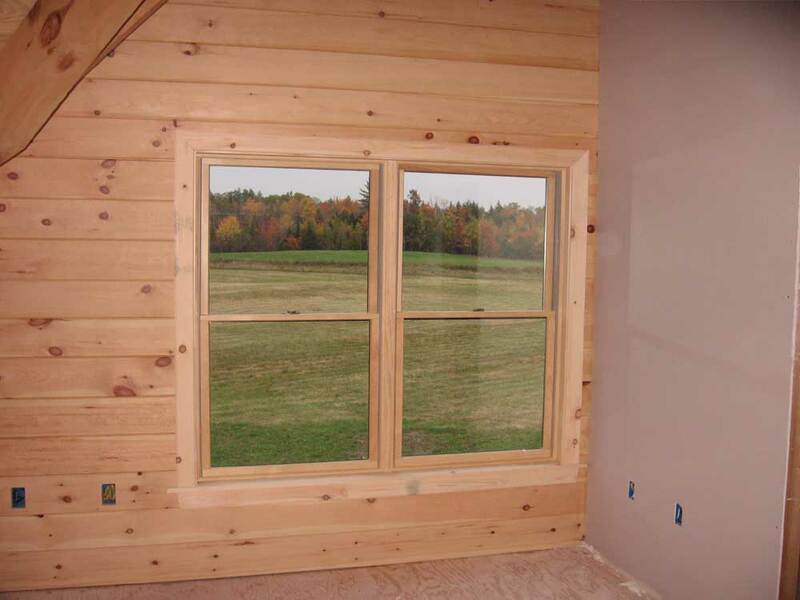 The choice of V-match as the interior finish surface meant that the supplied window extension jambs were 1/2" too short, as they are designed to be flush with typical 1/2" drywall; V-match is 3/4" thick. So after I installed the extension jambs, I had to take some scrap material down to the shop to mill some 1/4" strips, which I then nailed over the extension jambs to make up the difference in thickness. The first window stool I installed was the wrong length--too short. I have been allowing 1-1/2" of the stool to extend past the outer edge of the window casing, which means that the stool is 3" longer than the width between the casing edges. In this case, I measured the width of the casing, but forgot to add the 3" when I cut it...oops! Of course, I didn't discover this till I had it all nailed up, and went to install the side casing. I had to pry off the stool and make a new one. The remainder of the window went smoothly, though it took several trips up and down the stairs to get the top piece fitted correctly (down the stairs to the chop saw each time I have to trim a bit more off the piece). 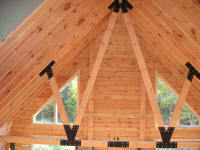 Next, it was time to address the double window and triangle piece in the front dormer gable. 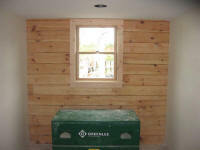 The stock extension jambs fit fine on the double window, since this wall was sheetrocked. 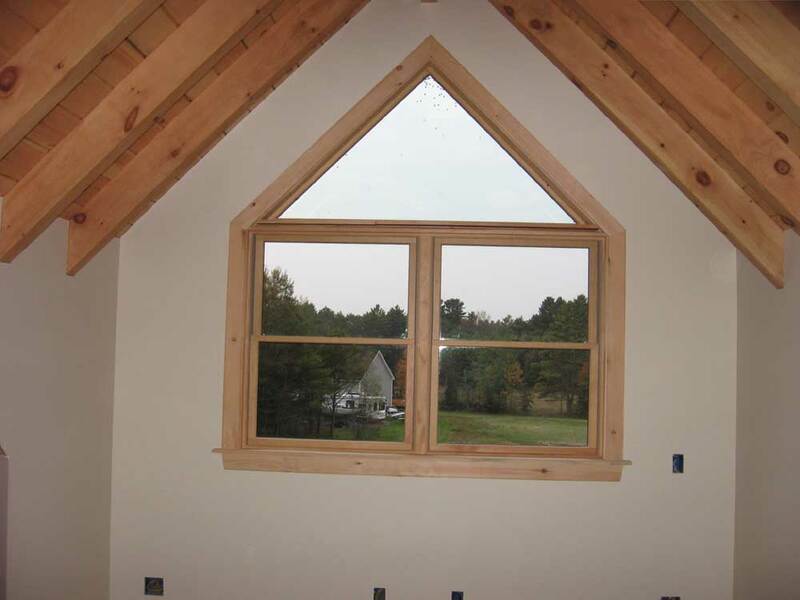 But I had to search through my supply of extension jamb material to find the pieces intended for triangle window at the top, which was very thin and required wide extension jambs. I eventually found the right pieces, though they were just overlong lengths of stock that now required cutting and fitting to size. This all took time, and finishing up most of this window took the rest of the afternoon. For this window, I used some trim stock that had only the bead detail on the outer edge, with no chamfer on the inside. I did this because there would have to be a horizontal trim piece covering the joint between the double window unit and the triangle, and with this piece mating into the side casing right at the transition angle, I thought it would be best to mill the chamfers once all the trim was in place, so that the chamfer could continue right around these corners formed by the top trim piece. I did mill 12" or so of the chamfer at the bottoms of the casing, though, since the projecting stool would interfere with the router base plate and would prevent the router from reaching all the way down once the trim was installed. I managed to complete all of the trim on this window except for the horizontal trim piece between the two window units; I'd have to rip a piece of stock to the correct width in order to install this, so I left it for tomorrow. Yes, those black spots at the top of the window are flies--dozens of them. With no screens on the windows and doors at this point, there have been plenty of flies and wasps in the house. This window seems to be their favorite gathering point. 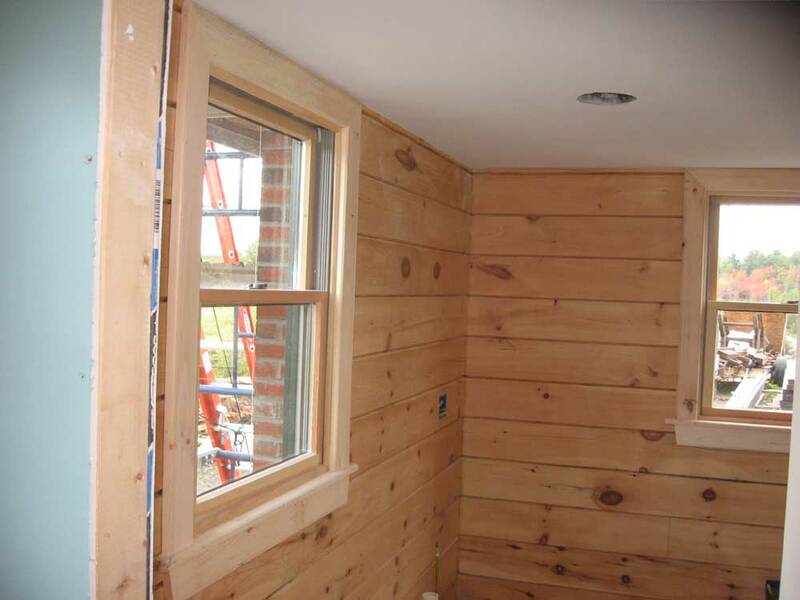 The only window trim remaining to be done is on the master bedroom closet window (to be completed once the sheetrock is mudded and painted in a few days from now) and the bow window in the upstairs bathroom, which still isn't even installed. I started the day up in the bedroom, where I cut away the tape at the edges of the sheetrock around the rafters, wall edges, and ceilings, as has now become routine. I worked my way around the room and was generally pleased with how everything came out. Since I still had the staging set up, I decided to just go ahead and sand the single wall of V-match paneling so that I could apply the polyurethane, before dismantling the staging to use elsewhere. 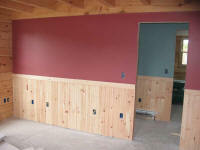 The wall didn't need a lot of sanding--just enough to remove some dirt and stains, and to even out the color of the wood. 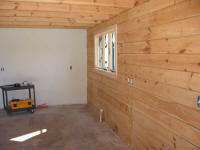 It brought back memories of all the sanding I did on the rest of the wood in the house. 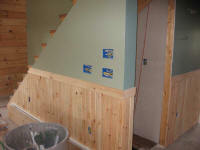 With the sanding done, I applied two coats of polyurethane to the entire wall, completing yet another task on my list. 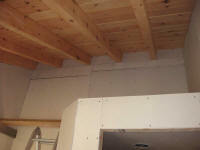 I dismantled the staging and set it up in the walk-in closet so that I could finish up the drywall and taping in there. 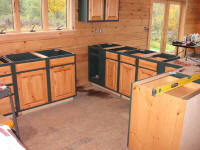 I received word that the kitchen and bath cabinets would be done next week, and would be delivered on the 12th. Of course, we have long-standing plans to go away on the 13th for a long weekend in New Hampshire, so that meant that I wouldn't be able to start cabinet installation till Monday. Isn't that always the way? 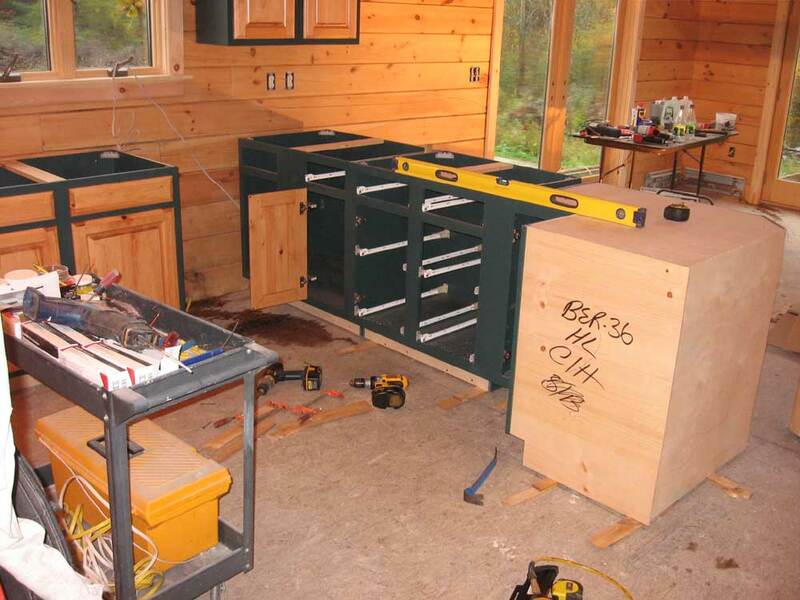 In any event, I was happy to hear that the cabinets were on schedule, and despite the minor inconvenience of a relaxing weekend away, looked forward to their arrival. I made further arrangements for the granite people to come in on the 19th to template the finished cabinets for the countertop. Yee-ha! 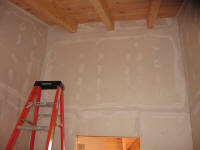 During most of the remainder of the day, I worked on the sheetrock in the closet upstairs. All that remained were the small pieces around the rafters at the top, but these are time-consuming. I tried to get a very tight fit on these since I didn't want to go to the effort of edge taping the pieces in the top of a closet where they'd never be seen. When the pieces were installed, I went ahead and mudded and taped everything that I could reach from the staging, leaving the lower sections of the walls for later, once I removed the staging (which took up the whole room). I also fitted a few additional pieces of sheetrock in the basement stairwell, closing up the remaining side. I had waited on this to ensure that I had enough sheetrock in stock to complete the rooms upstairs, but it was now clear that I had abundant supply. I knocked off around 5 so that I could clean up outside a bit. There was a gross pile of sheetrock that had been lying there for a couple or three weeks, and I was sick of it; in addition, I had determined that I had no need for the scraps that I had saved indoors, and had piled on the floor in the craft room, so I threw those out as well. I collected all this junk in my big ugly yellow truck for eventual transport to the dump. We had some rain overnight, and I found a small leak beneath the Dutch door when I arrived this morning. I had noticed this one other time, and have been trying to figure out where the water is coming from. 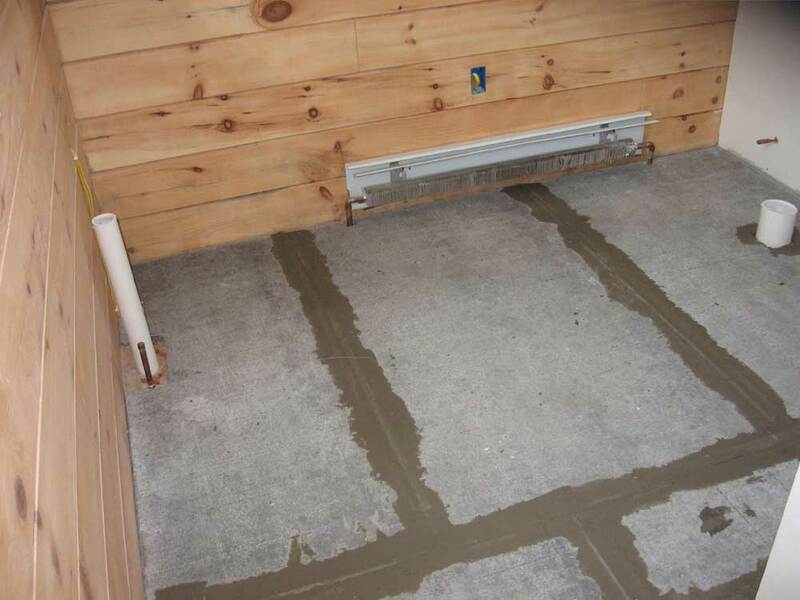 I think that a temporary 2x4 I have nailed beneath the overhanging threshold on the outside is channeling water beneath the threshold and into the house. I may try removing that 2x4. I am pretty sure it's not coming from the trim on the outside, which I sealed well beneath during installation with Sikaflex and rubber flashing tape. In any event, I'd like to figure this out before I install the interior trim on this door. 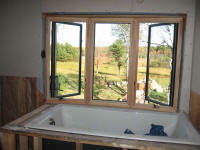 I began this morning with some trim on the two windows in the downstairs bathroom. Since both windows were identical, I "mass produced" the trim for both at the same time, which sped up the process somewhat. 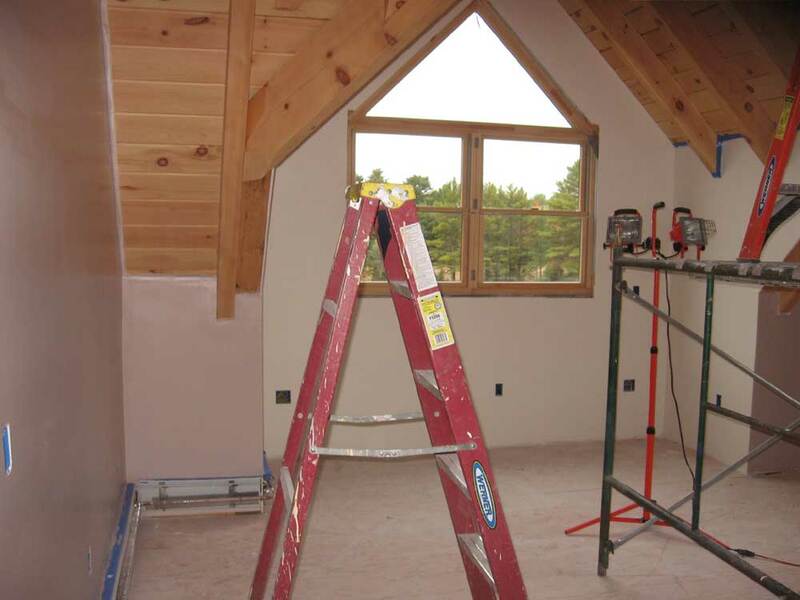 Afterwards, I really wanted to keep going with trim, but I decided instead to apply primer to the sheetrock in the master bedroom. 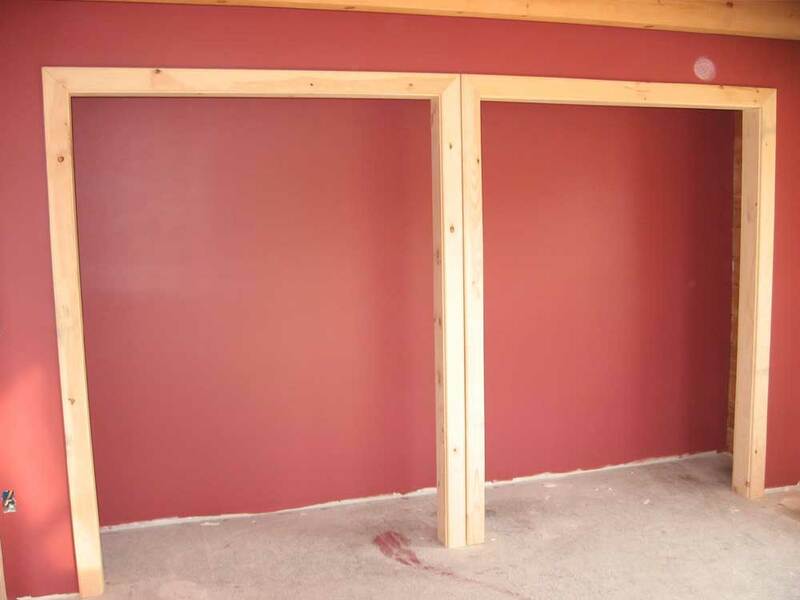 After all, getting the walls done had to be the priority, since not only did I need the pipe staging elsewhere, but having the walls painted would mean that the room would be more or less complete and ready for additional steps. There was a lot to prime, and it took a couple hours to complete. While I waited for the primer to dry, I decided to take an early lunch rather than try to get involved in some other project. See, I had decided to just get all the painting done today, while earlier I had thought that perhaps I'd just do the primer. We chose a two-color approach for the bedroom. 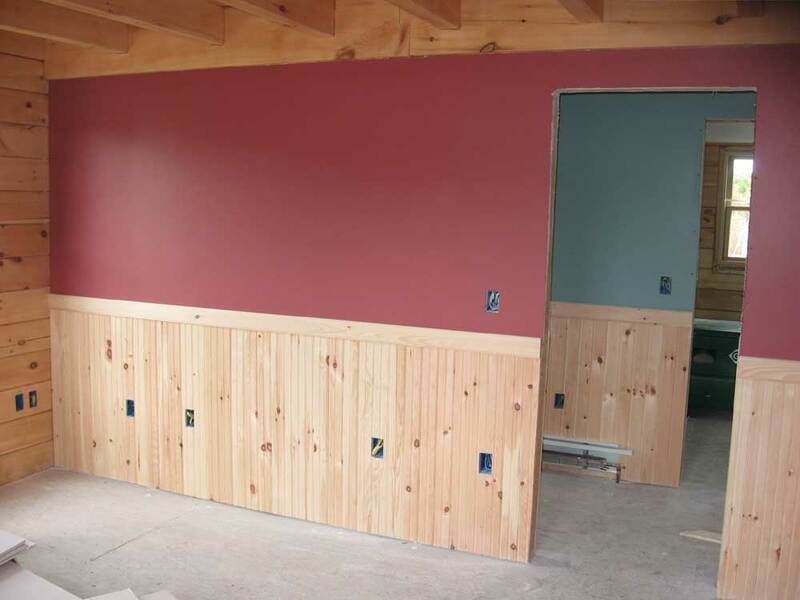 There was a lot of wall space, with the 13' tall walls on the interior walls of the bedroom, and we thought it might be nice to break up the color a bit. 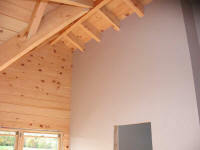 Inside the front dormer, we decided on Dover White; for the remaining walls, we selected Temperate Taupe. 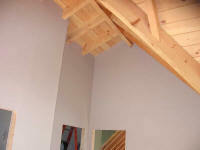 I began with the Dover white in the dormer, and applied one coat rather quickly. 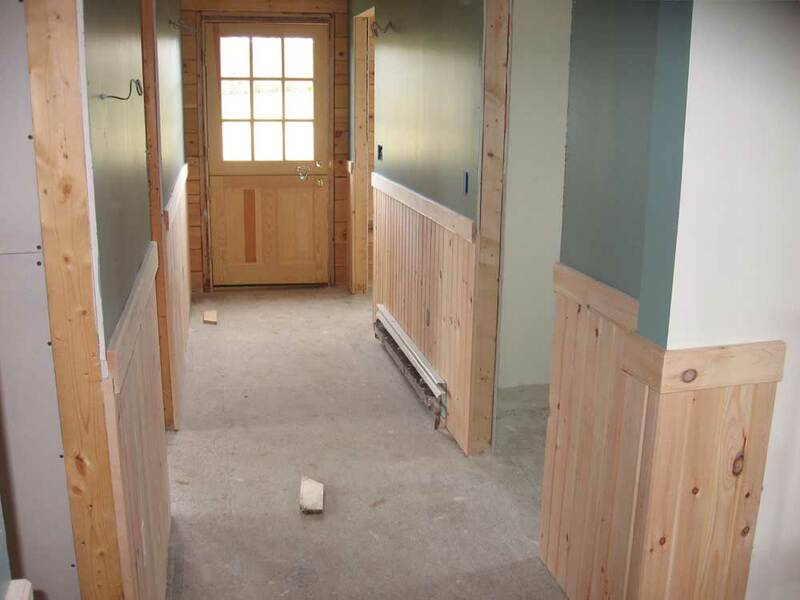 Then, while waiting for that to dry enough to recoat, I went downstairs and began the process of installing the pine trim around the inside of the closet door openings in Heidi's craft room. 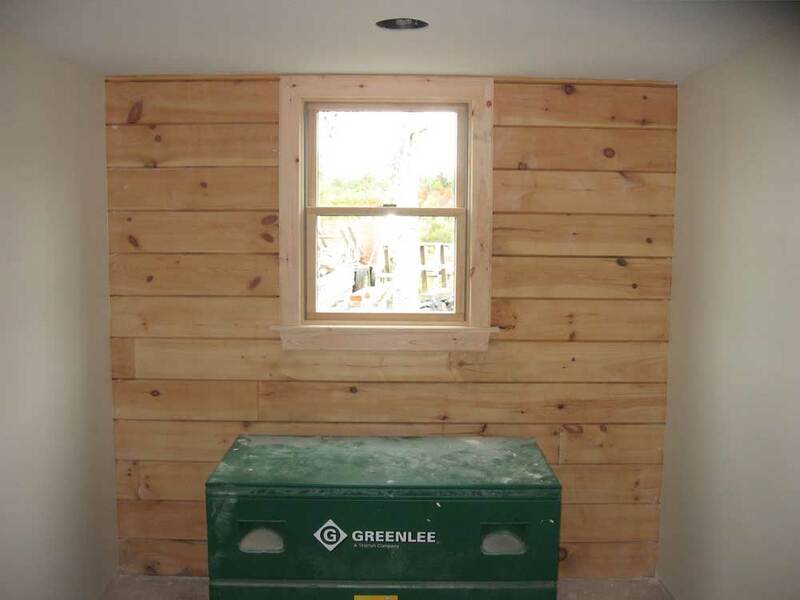 For one reason or another, I blindly thought that the 5-1/2" wide pine that I had on hand would fit the opening, but when I went to install the first piece I realized that the pieces needed to be ripped to 4-1/2" to fit the width of the wall. 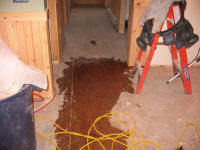 While this wasn't a big deal certainly, it did thwart my effort to complete this job now. Instead, I rough cut the various pieces to length and prepared them to bring to the shop, where I'd rip them with the table saw later. To kill some more time, I moved some lumber around, removing some of the pine trim stock from the first floor and bringing them to the basement for storage and to get them out of the way. By now, the paint was dry, and I applied the second coat of Dover white to the dormer. 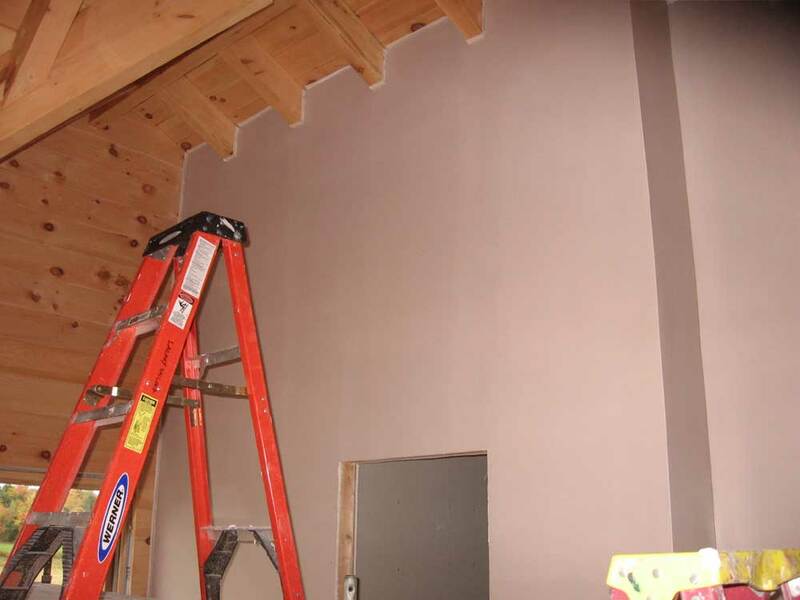 Then, I continued right away with the taupe paint in the rest of the room, and spent the rest of the afternoon applying the two coats required. I'm just about painted out, so it's a good thing that all that remains is the master bedroom closet (still awaiting some small sheetrock pieces, mud, and tape) and the master bathroom, which is currently being neglected on the back burner. First thing, I cut away the sheetrock tape from the rooms I painted yesterday--the craft room, bathroom, pantry, and kitchen. The finished paint looked great. I continued with some more trim work. Earlier, I had milled some pieces of trim to use as a transition between the sheetrock and vertical V-match in the hallway and craft room, and now I spent some time cutting those pieces to fit and installing them. This went quite smoothly, except for the last corner--between the stairwall and the hallway--where the mud and corner bead had created a corner that was far from 90°. This made the fitting a bit more challenging, but it worked. 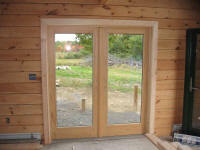 Next, I worked on the third, and final, French door. 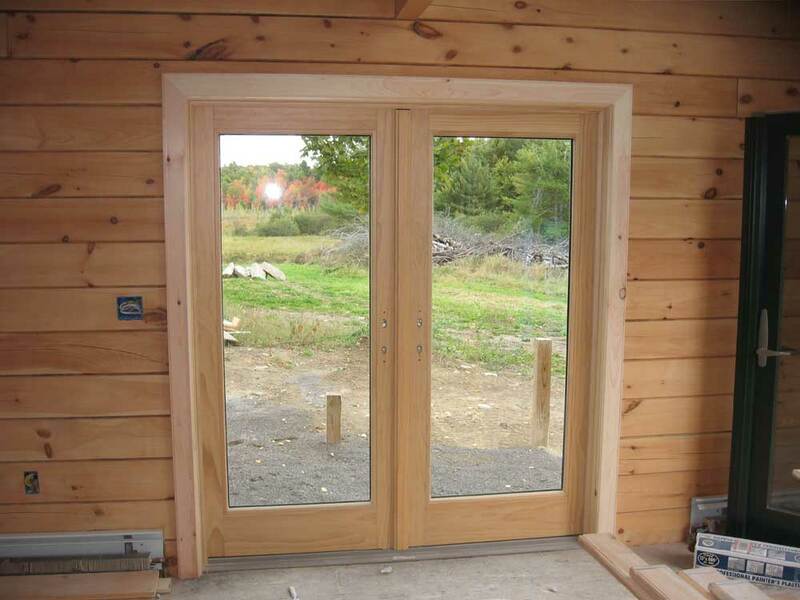 This particular door, the one in the back of the house leading to the eventual screen porch, had some installation intricacies that caused the reveal around the door to be inconsistent on one side. Fortunately, the fix turned out to be easier than I had thought. The gap widened on only one side of the door, and only to a point about 24" off the floor, so I cut a thicker piece of extension jamb (3/4") for this section, and then framed the remainder of the door with the same 1/2" extension jamb that I used on the other doors. The slight inconsistency will never be noticed...except by all of you, since I was nice enough to highlight it here. I finished up the trim on the door with little fanfare. When installing trim, I first cut the pieces to size, and then, just before installation, I sand them with 120 to smooth and clean them. However, I find that I tend to frequently forget to sand the top piece--which is the last piece I install--because I end up taking it up and down several times to fine tune the fit at the miter ends. Maybe my writing it down here I'll start thinking more about it and avoid this annoying--though easily fixed--issue. I kept moving with the trim, and installed the window trim in the pantry, using the same style and techniques as those employed in the great room and kitchen. 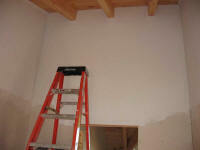 By now, it was a little after 1, and I had vowed to get the drywall sanding in the bedroom today. Since this is a job best left to the end of the day, given the amount of dust and dirtiness that result, I decided to go ahead and do this now. I hoped to finish early today, as I needed to spend some quality time in my office catching up on long-neglected paperwork that I seem to never find time for, so I got my materials together and prepared to sand. For this room, I broke out my big supplied air mask, rather than the small half-mask respirator I had been wearing during the other sanding, since there was such a large amount of sheetrock to be sanded. The sanding went well, and fairly quickly. I finished in about 1-1/2 hours, which wasn't too bad. I spent a half hour or 45 minutes cleaning up the house and organizing tools, and then called it a day around 4.